Just a word to say that I only got home at 11.30pm with a camera full of pictures and no time to do a full post. I will do a proper post tomorrow morning. 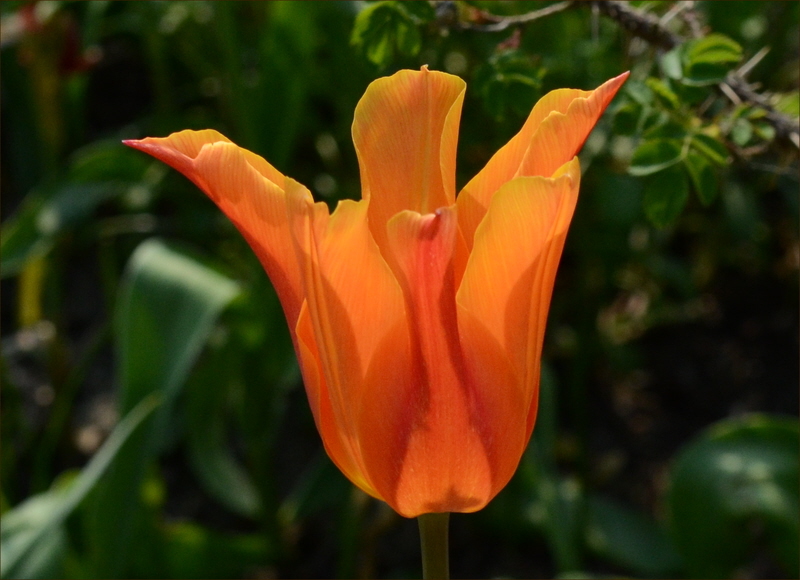 Today’s picture is yet another tulip. I can’t help it. 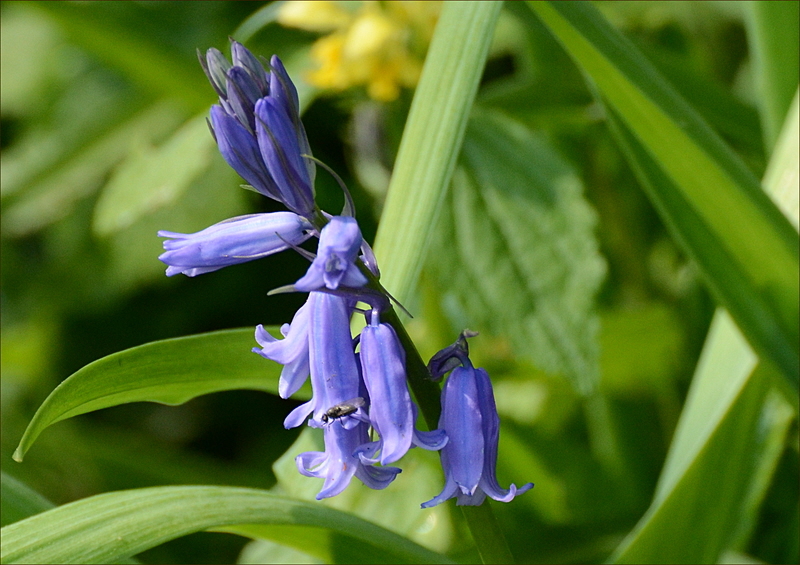 Although we are still waiting for some rain, the weather took a more suitable turn for April today with a brisk and rather chilly wind. We said goodbye to our B & B guest who was cycling to Land’s End. He has been enjoying a very helpful wind and that seems set to continue. I have put his picture on the cycling page in our end to end gallery. I was suffering from the fast time I had done on the slow bike yesterday and my breathing was bad from the start of the morning pedal with Dropscone. 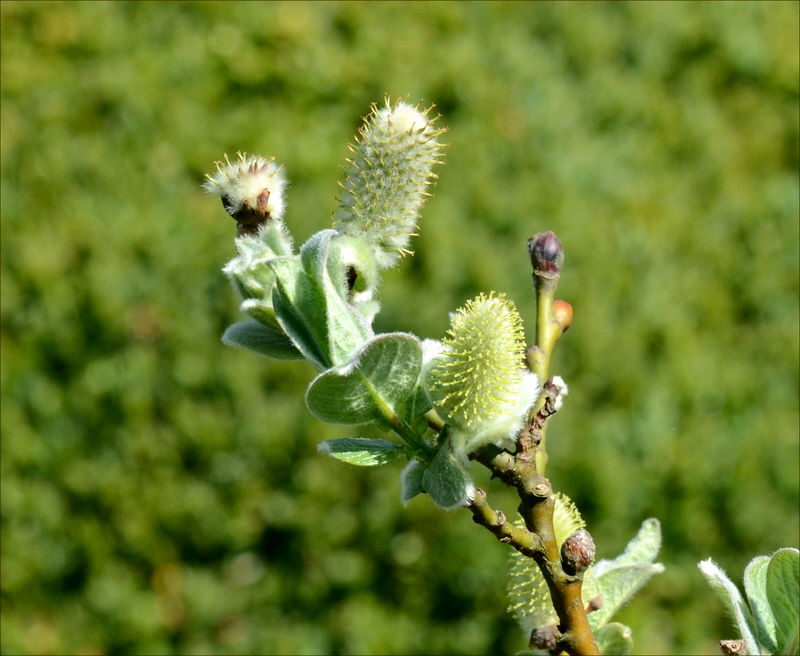 The windier weather doesn’t help, blowing lots of dust and pollen about. There is a lot of dirt on the roads and passing lorries kick up mini sandstorms as they go by. All this meant that Dropscone had to wait for me the whole way round our circuit and we took nine minutes (that’s nearly two miles in distance) longer than yesterday. The consolation was a supply of excellent drop scones to go with the coffee. The trouble about bad conditions is that you only know you have been too energetic after you have done it and by then it is too late not to do it. I felt fine when we were going round yesterday. 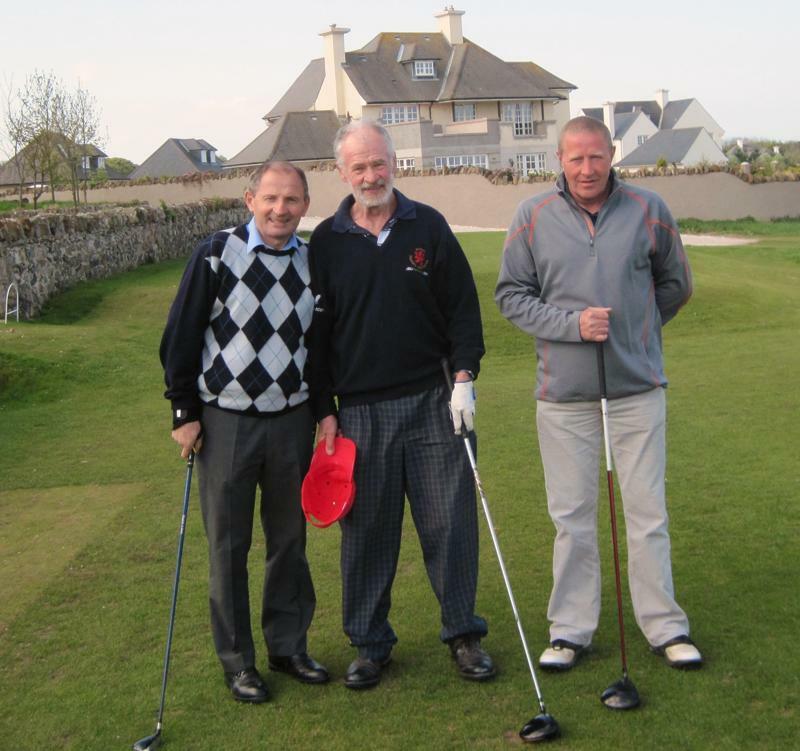 My chest is still sore as I write this and I don’t fancy my chances of scoring less than a hundred at the golf tomorrow. I would add that the poor breathing is not a serious matter, just an annoying one. As a result of all this, I didn’t do very much after the cycle and I was able to spend some time with the camera in hand. 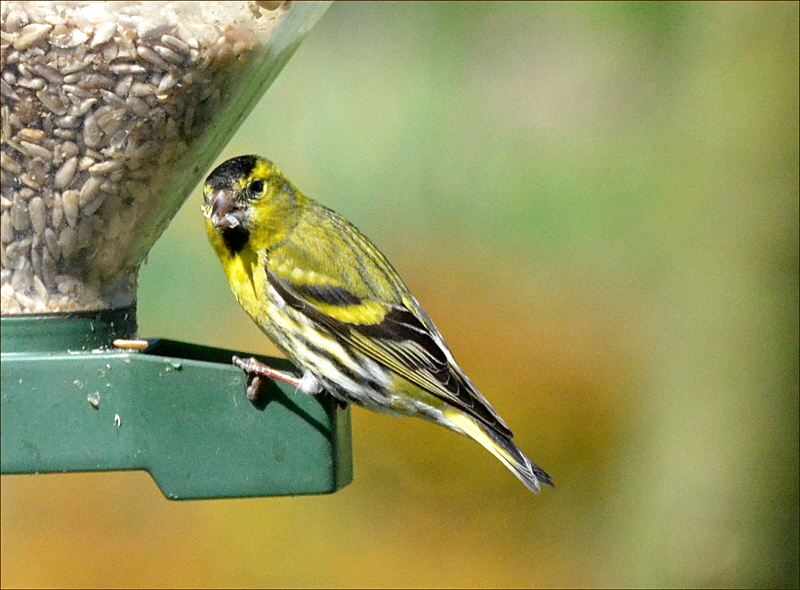 I took pictures of the small birds that visited us today. 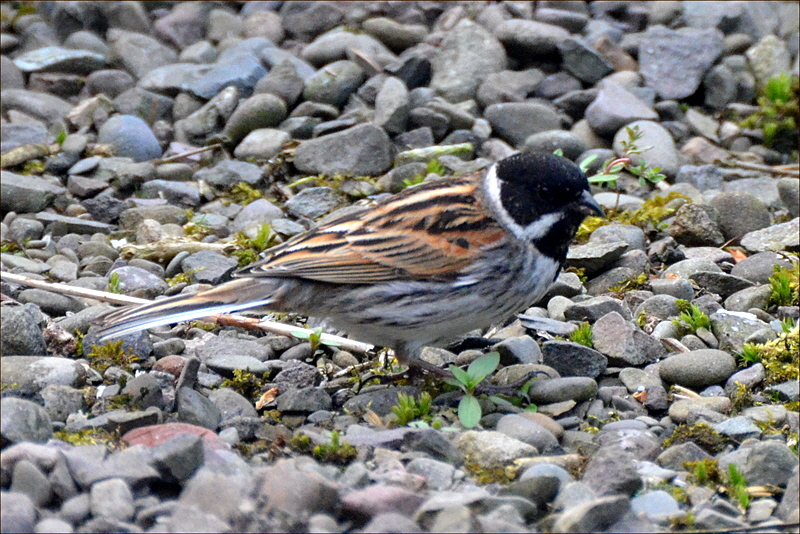 ..and lastly a very rare visitor to the garden, a reed bunting. 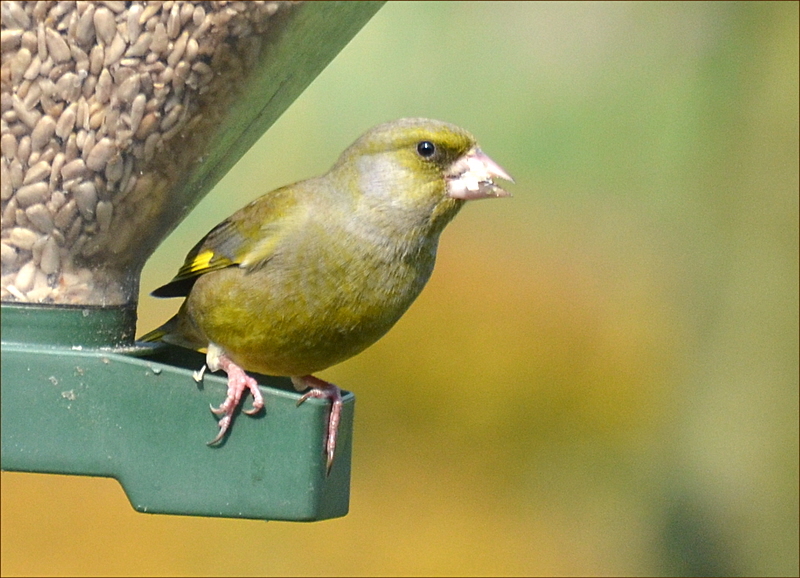 He was possibly with a female bunting but I couldn’t get a satisfactory shot to make sure. 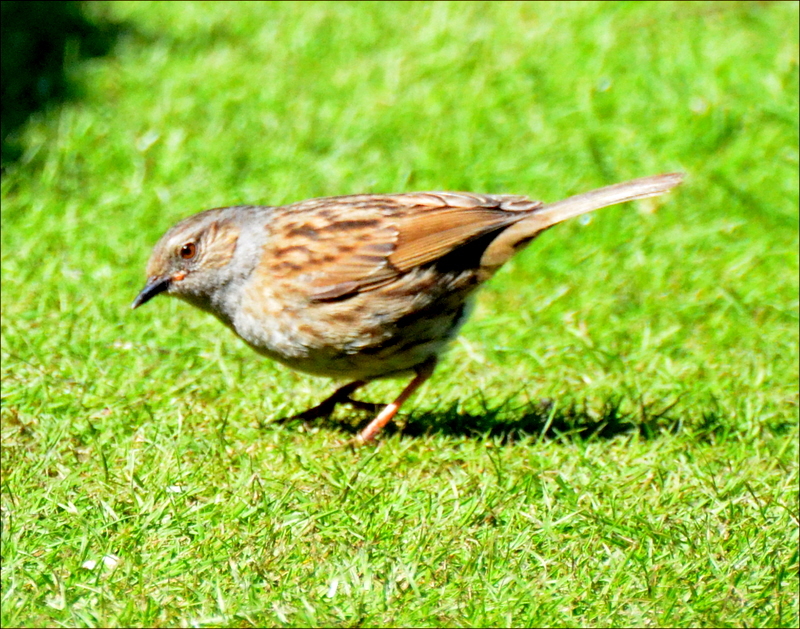 The only small bird I don’t get a good look at was a dunnock. They were there but wouldn’t stand still when I told them to. 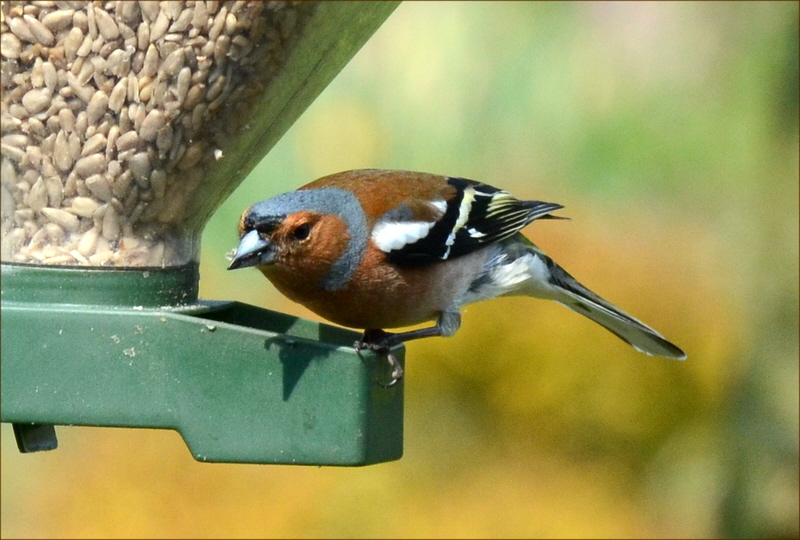 Other bigger birds in the garden today were jackdaws, starlings and collared doves. A heron flew overhead. I had quite a hard time not watching some sort of ceremony on the telly as Mrs Tootlepedal was an interested spectator for most of the morning. The synthetic excitement over a public kiss of a couple who have been living together for eight years sums up all that is bad in sycophantic journalism in this country. I am also amused by the presentation of St Andrews University as the only example of somewhere where a boy may meet a girl. I thought that happened at every seat of higher education. I spent some time sieving compost again today. The sieved result has gone onto the leek bed so I am looking forward to leek and potato soup in due course. 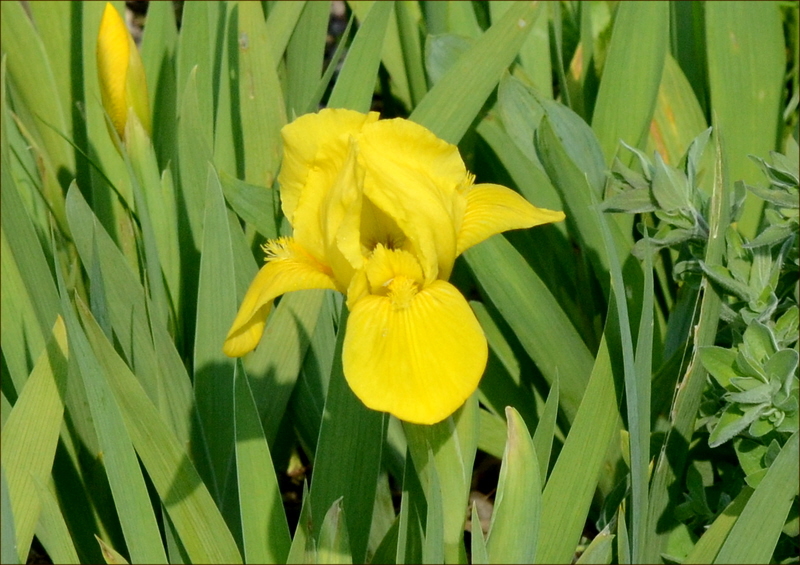 As the daffodils have gone and the tulips are beginning to fade away, new flowers are appearing every day. 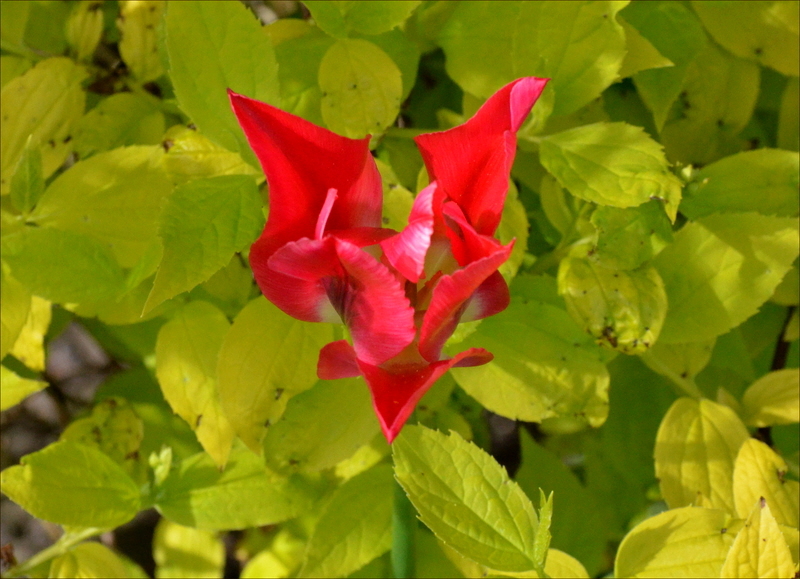 Not every interesting plant is showy. 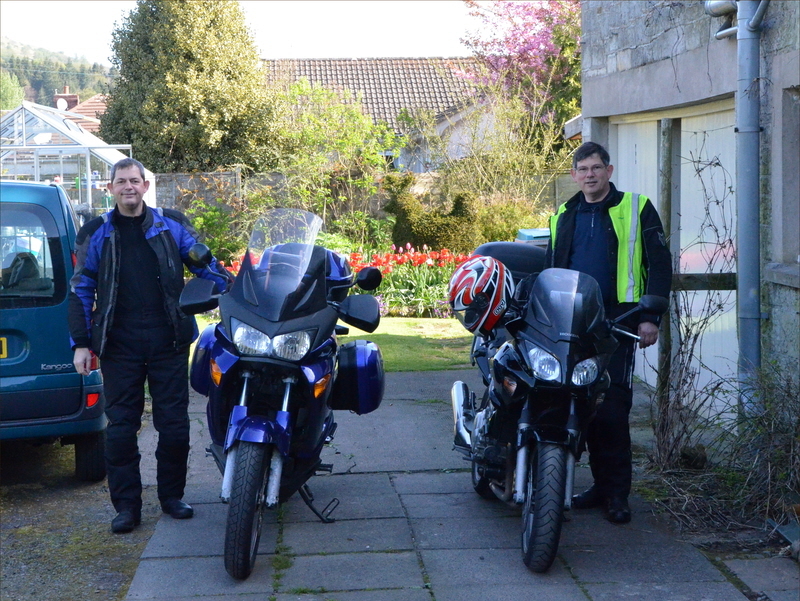 In the evening we welcomed another cycling B & B guest also doing the Land’s End to John O’Groats trip. He was heading north and had had a very hard day cycling into the stiff wind. It looks as though he will have the same battle for the next few days. It really is a lottery choosing your direction of travel as far as the weather is concerned. In the evening, we also welcomed the Tinkers for music and conversation and Mrs Tinker and I did considerable damage to several sonatas and enjoyed ourselves a lot while we were doing it. Handel in C was our best effort. 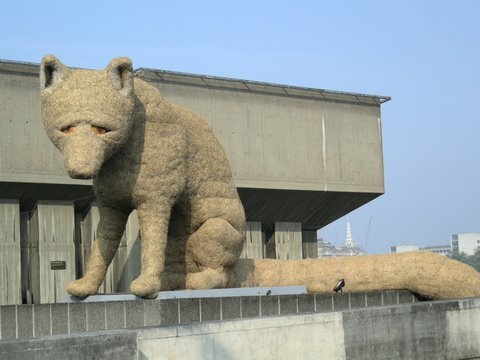 Today’s picture is another from the South Bank festival remembering the Festival of Britain of 1951. It came from my sister Mary. I wouldn’t like to say what it is. After my day of rest yesterday, Dropscone appeared for the morning ride and laughed merrily when I said I was hoping for a gentle pedal. As it turned out, with a light but friendly wind, perfect cycling temperatures and the legs feeling in good order, we went round the morning run at 14.5 mph on the slow bike which is as good as I have ever done on that bike. We whizzed up one steep little hill so quickly that my heavy breathing brought up stuff from the bottom of my lungs that was reminiscent of horror films of the 1950s. ‘The Thing from the Blue Swamp’ springs to mind. All the same, it was most enjoyable and made me feel that I might be getting a little fitter than I was during the winter. Dropscone is certainly a lot fitter than he has been. After coffee and scones, I delivered the 50 DVDs I had produced over the last couple of days to the Langholm Initiative and felt quite industrious for a retired person. 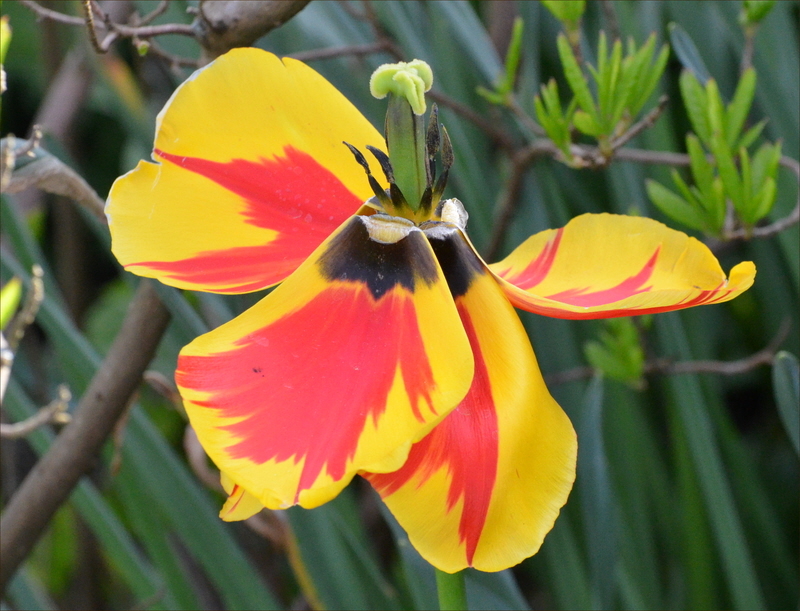 When I returned, I was struck once again by the glorious colours in the garden at the moment. 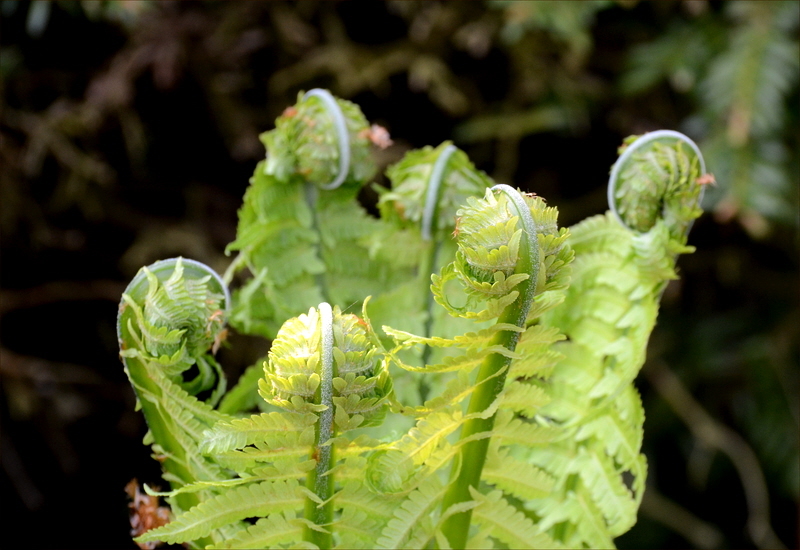 The more or less continuously fine weather of the last two months has brought everything on in the garden far earlier than usual. 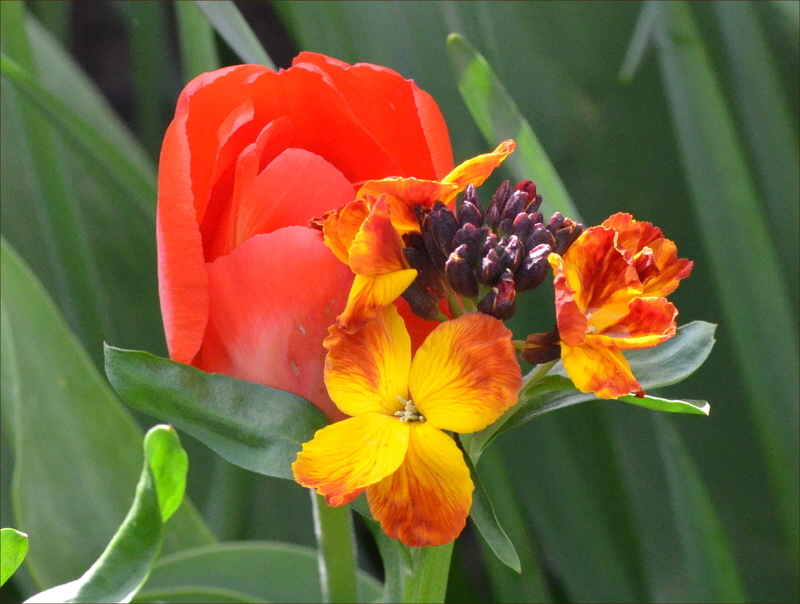 The daffodils are now gone and the tulips by and large are now on the way out too. 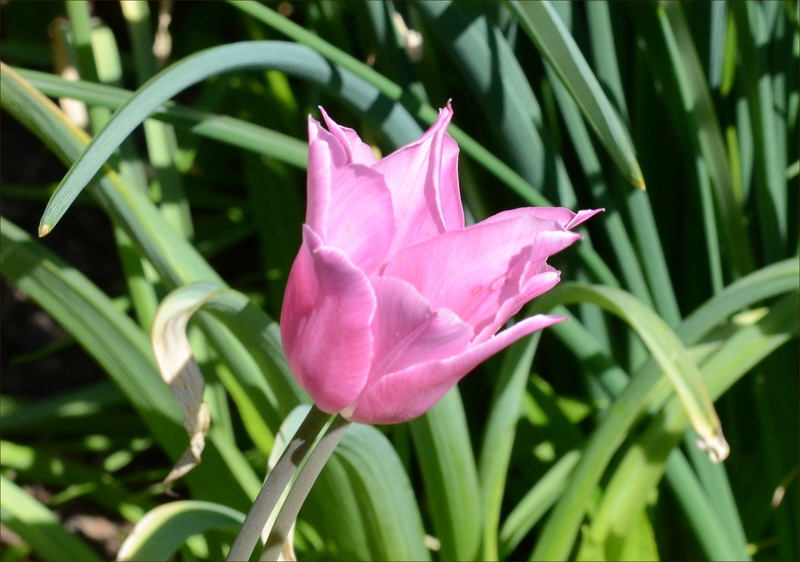 Some fresh tulips are still springing up here and there. 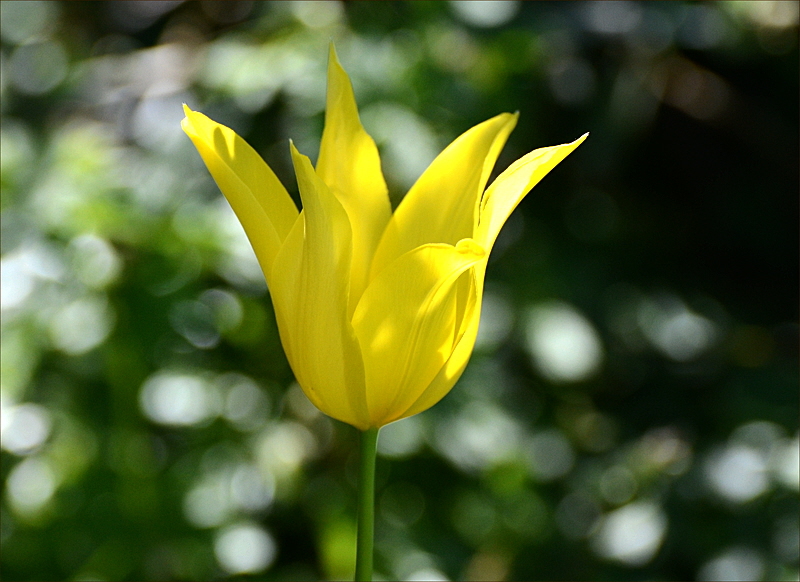 A rogue white tulip appeared among a bunch of yellow ones. 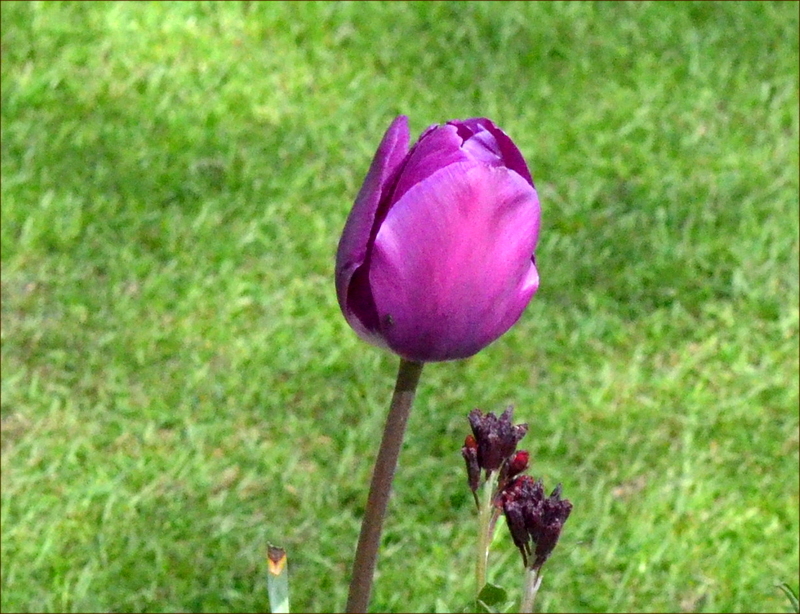 ..and another sort of pink tulip has also shown up. 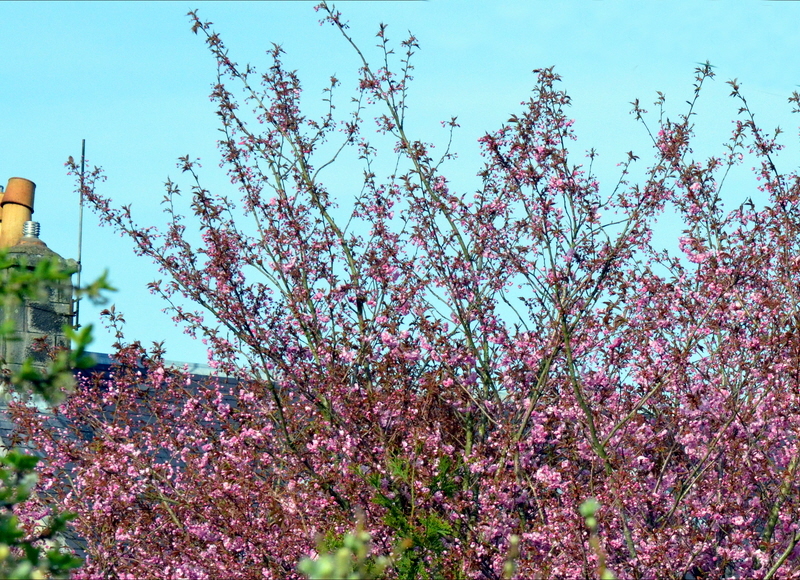 Among the blossoms, our bird life is quite busy and we saw a blackbird feeding its young today. 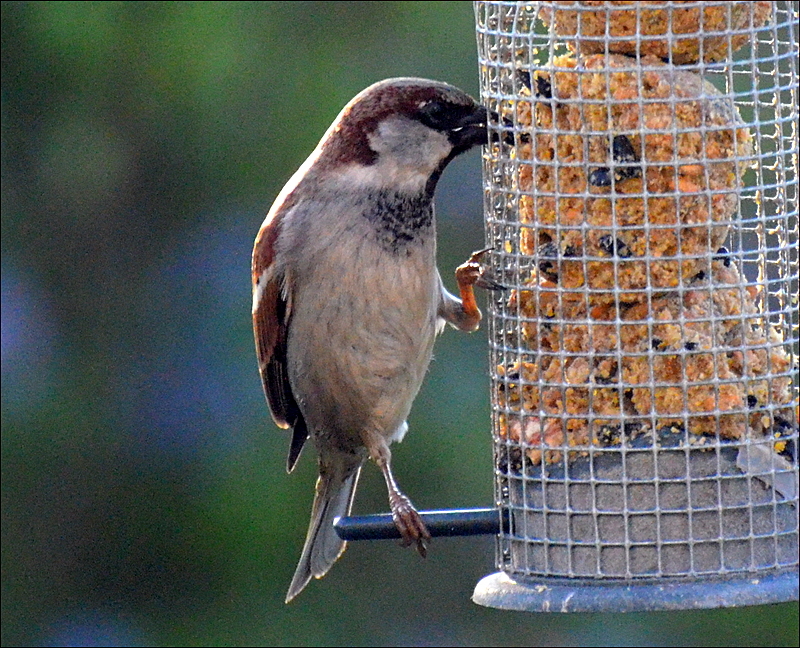 They certainly have been busy collecting worms. You can see how fearless they are when this one has let me get so close to it. The dunnocks are more twitchy when I approach them but they too are getting calmer. 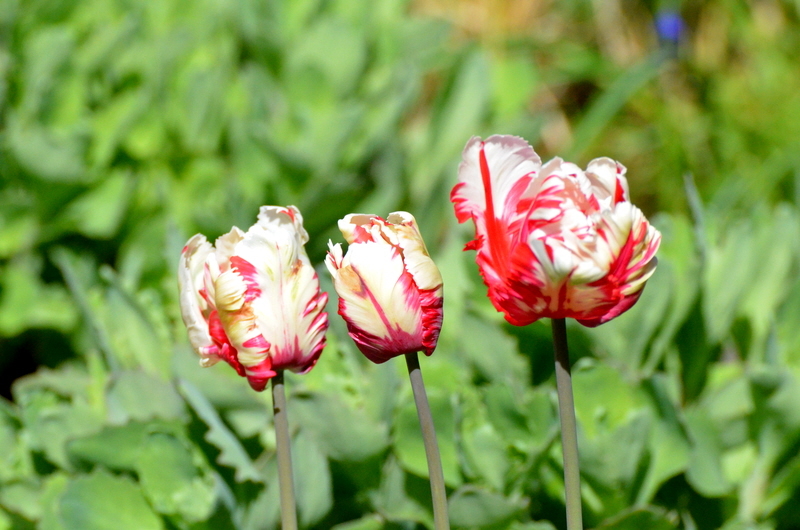 Not all the tulips are in your face. 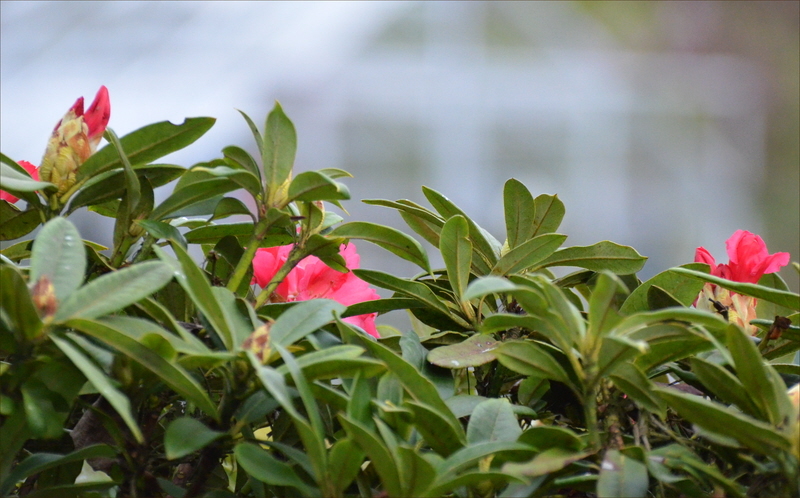 This one is blushing almost unseen in the midst of other plants. 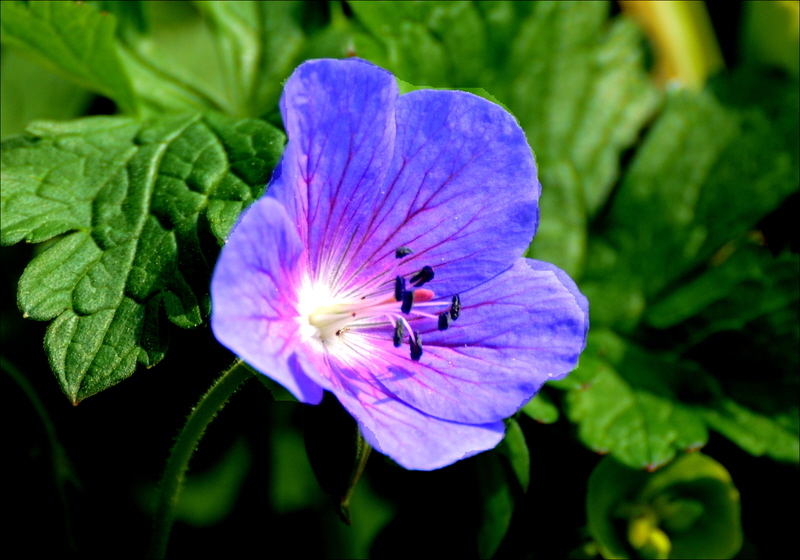 …and not everything that is growing is flashy. It certainly looks as though it will be a great season for fruit unless we have a bad late frost. 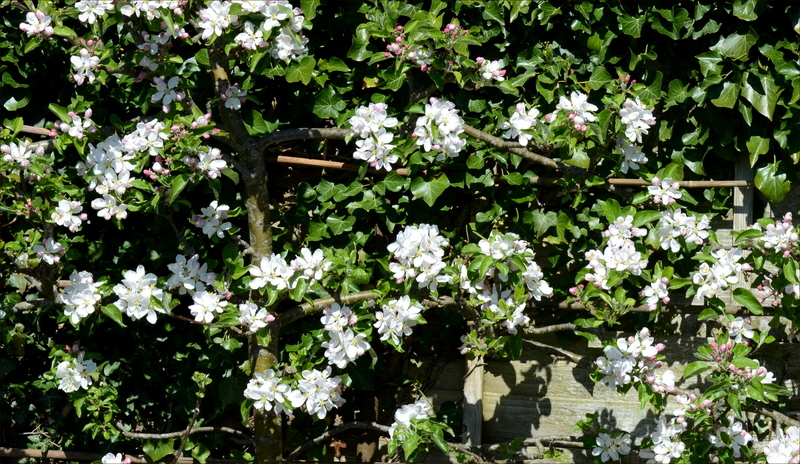 This Charles Ross apple is blossoming like mad. The white flowers in bright sunshine pose problems for an amateur photographer and I am trying to read my manual to get help but it offers so many features that it makes my head hurt a lot. In the afternoon, Mrs Tootlepedal and I turned some shredded compost into another bin and I sieved some of the shreddings to make a nice batch of mulch. Compost is most satisfactory stuff as it really is something for nothing. Even if you don’t achieve your first object, you just need to leave it alone for a bit and it will turn out fine. There’s not much in life that is like that. After this bit of work we needed a rest from the heat and fortunately we saw a friend passing by our gate so we made her come in and have a cup of tea with us. 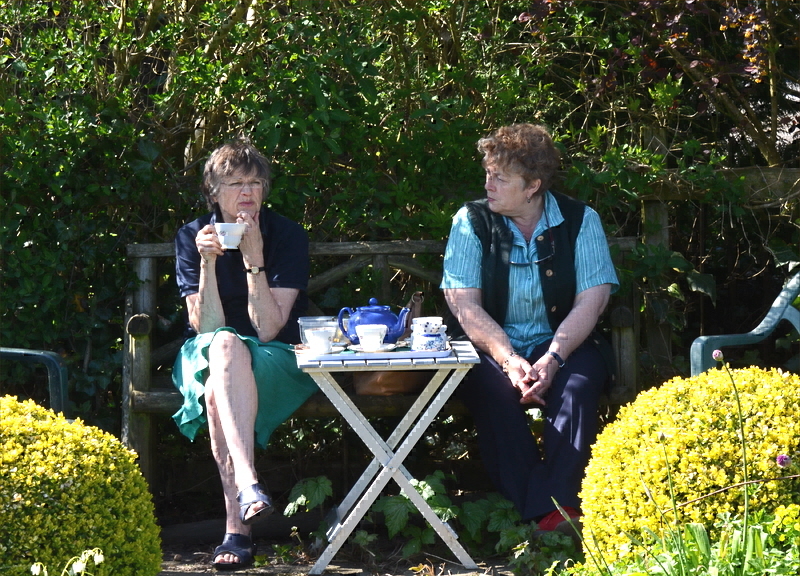 Because it was still so warm, we entertained Mrs Tinker to the cup of tea (and a dainty cupcake) under the walnut tree. As you can see from their expressions, Mrs Tootlepedal and Mrs Tinker take life very seriously. 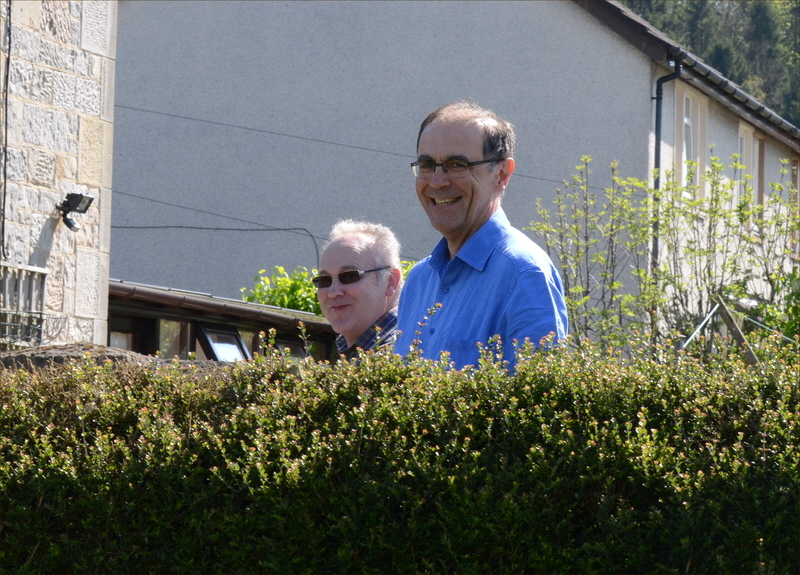 On the other hand, Dr Tinker, on his way to join us, and our friend Bob, who was passing the garden, have a more light hearted approach to life. In the early evening, after putting a week of the E & L into the database, I got the sprinkler out and gave one of the lawns a good watering. I have never had to do this in April before. 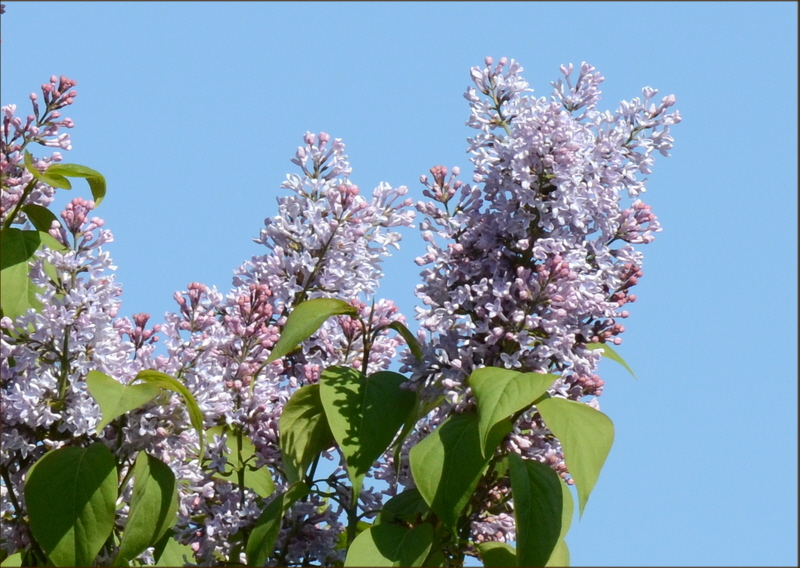 I noticed that our wild lilac is out as well. Obviously the severe winter has not held things back at all. I wonder what colour you would call this? After tea, I went to the Archive Centre with Sandy and Jean and put another two weeks of the E & L into the database. I was helped by Jean and Laura who turned up as well. In spite of putting in three weeks in one day, I am still a bit behind the indexers because of the work making the DVDs. That’s the trouble with fine weather, it gets in the way of dull work. The pain of being a bit behind was eased by a couple of excellent pints of Deuchars in the Douglas and even more by the fact that I didn’t pay for either of them. Today’s picture, sent to me by Dropscone, shows him off playing golf today instead of doing proper bicycling. In the absence of Dropscone, I had a rest from morning cycling and stayed to see our B & B guests off as Mrs Tootlepedal had to go to work. They had the means to go a little further on their two wheels than Mrs Tootlepedal and I have on ours. 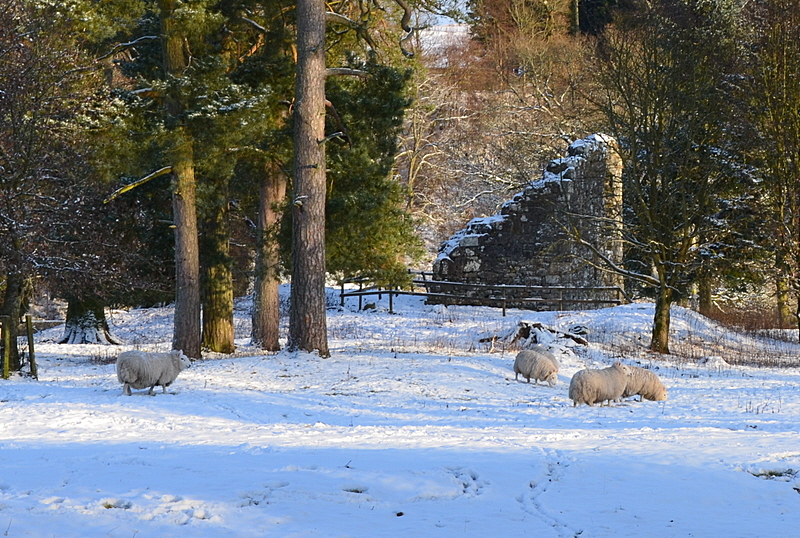 They were on their way to Aberfeldy via Copshaw and Keilder Forest – not the most direct way. 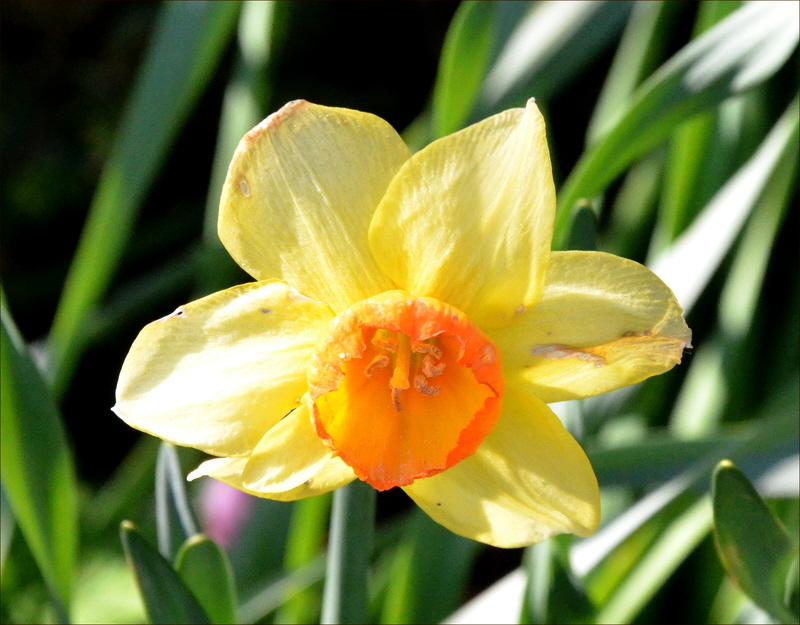 I did some of the necessary tidying up when they were gone but had time to walk round the garden looking at the last of the daffodils still in flower. 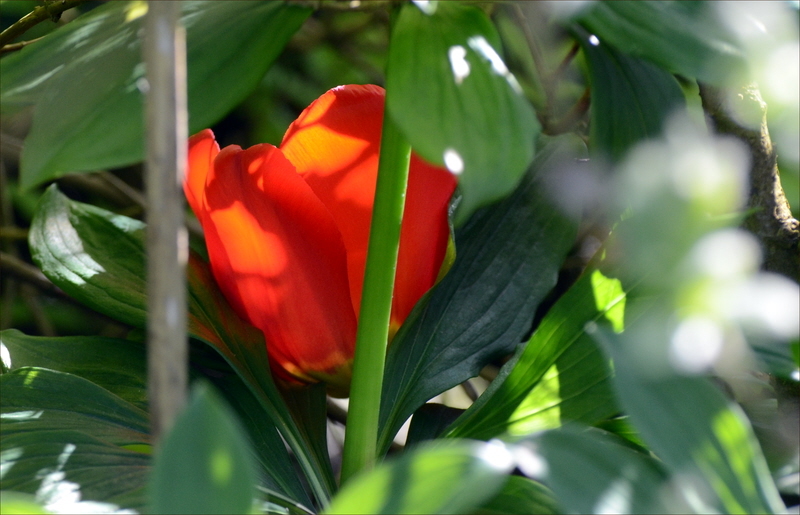 Mrs Tootlepedal has got some very weird looking tulips coming into bloom. 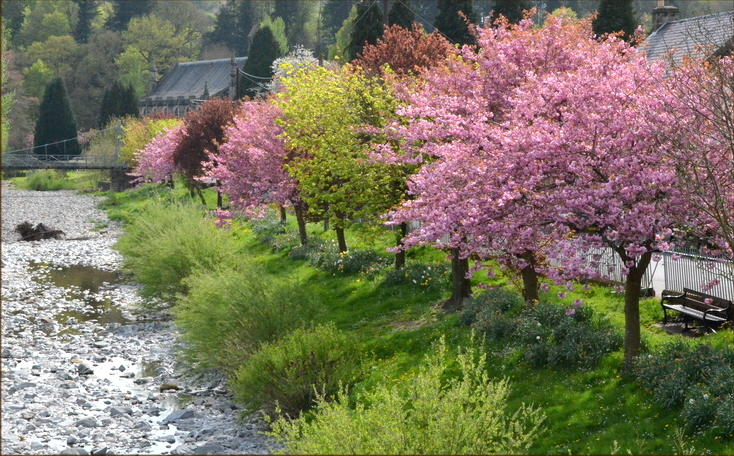 It was another beautiful day with the added bonus that the temperatures were at a more normal level for April than they have been. I am not very fond of really hot weather and certainly not in spring time. The garden is miles ahead of where it would normally be at this time of year and I don’t think that I have ever had to contemplate watering the lawn in April before. All the same, your heart sings when you get up to a fabulous blue sky. 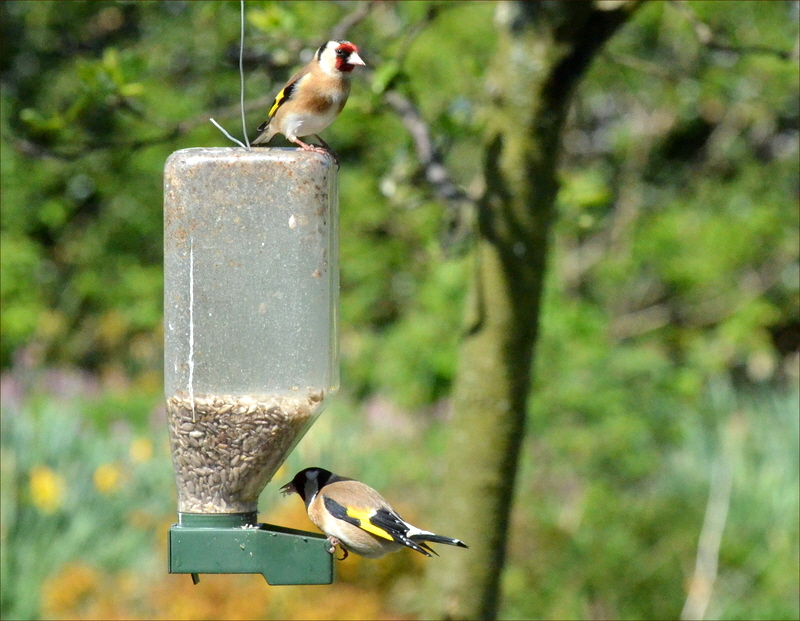 The birds look as though they enjoy it too. 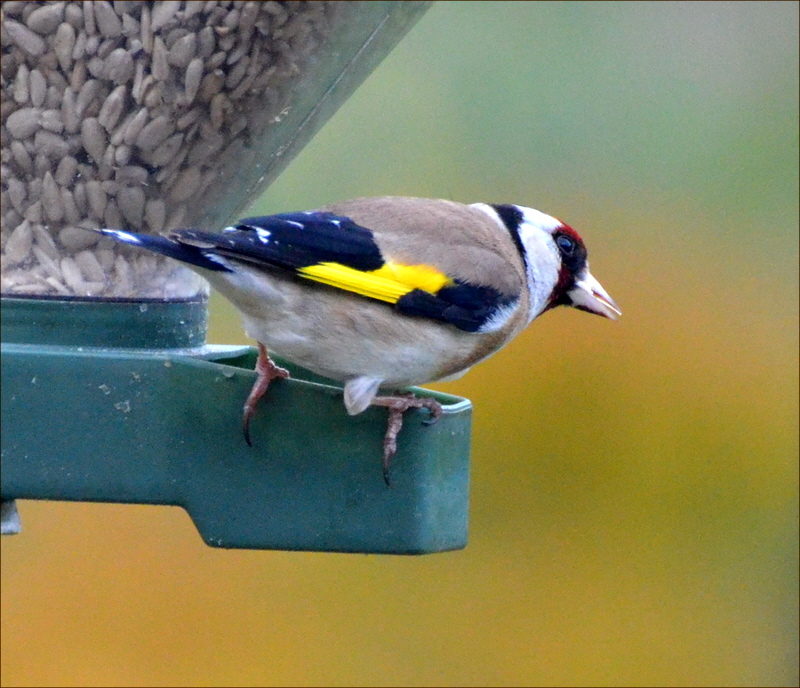 Some of our winter visitors have stayed and they are certainly very colourful among the sparrows. 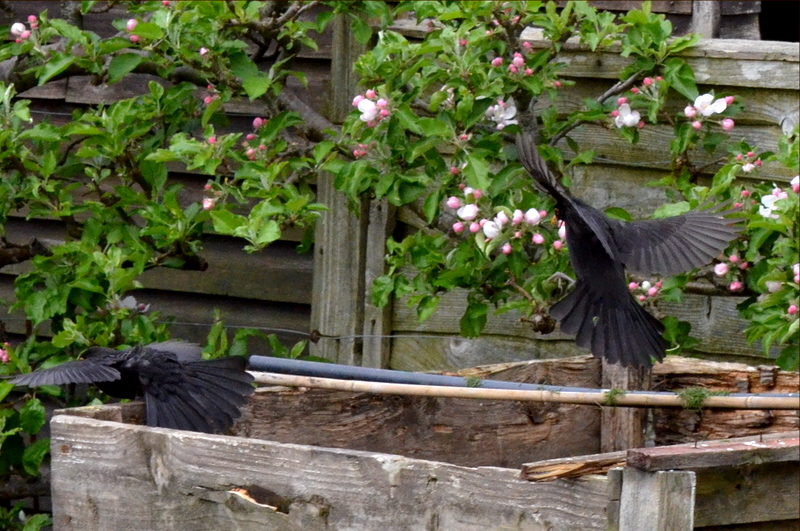 The blackbirds are very busy in every part of the garden. 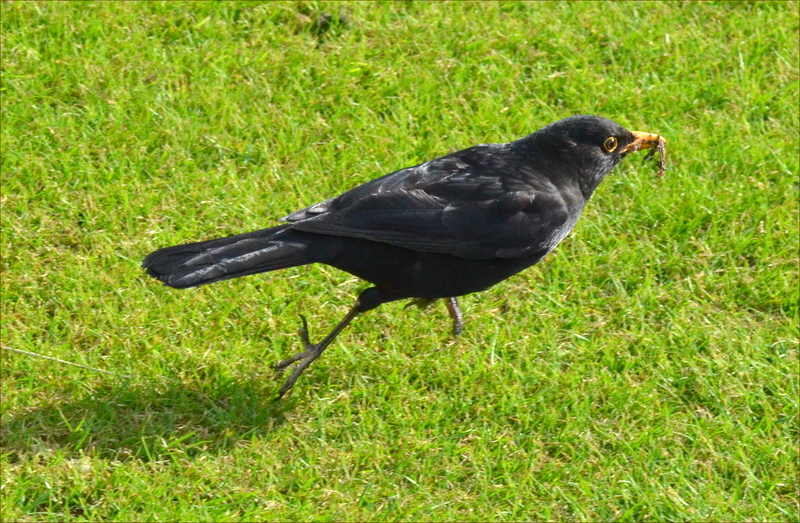 Here one enjoys the worms that are to be got on the lawn. 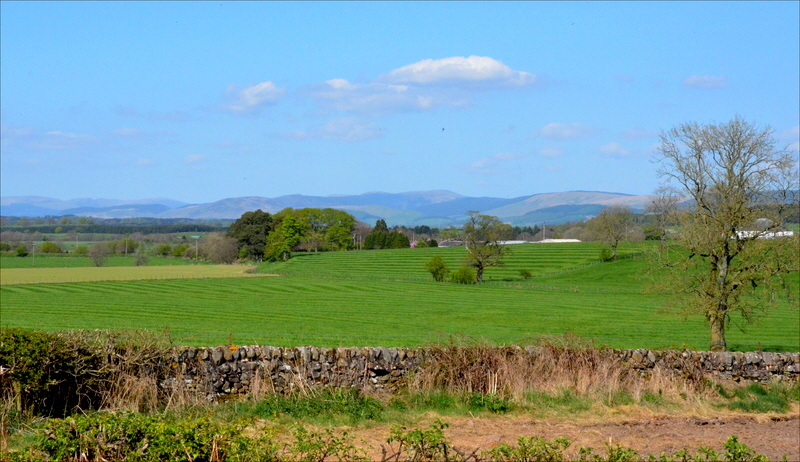 When Mrs Tootlepedal got home from work, she suggested a little cycle ride and after some discussion, we settled on a route starting from Lochmaben and going to Barony College and back by a different route. 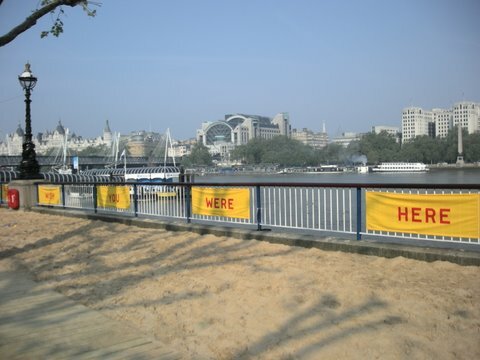 This is not familiar country to us and we were not sure whether it would be a good choice. It’s not the greenest activity going for a cycle ride when it needs a twenty mile drive before you start but we don’t have a big choice of roads round us and we have cycled them all many times. It turned out to be an excellent route. It was fairly flat but not dull, through rich farmland with a prospect of hills all around. We are looking over towards the hills on the East side of the M74 across the River Anann here. The route we were cycling on was strangely flat compared to the frequent undulations we are used to. Mrs Tootlepedal, who knows a bit about physical geography, reckoned that we were probably cycling on glacial till and when we crossed this small river, there was certainly plenty of gravel to be seen. 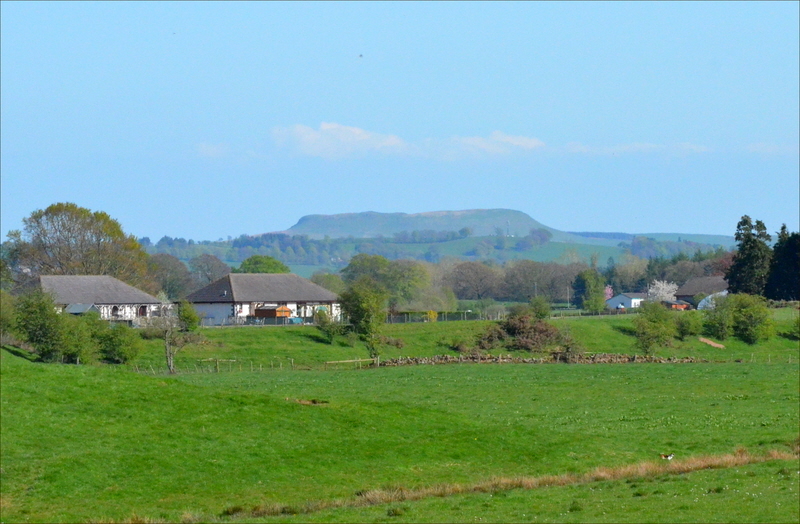 On our way back, the characteristic shape of Burnswark Hill was often in view. Altogether it was an extraordinarily enjoyable pedal and I certainly think we will be back in this area in the not too distant future. 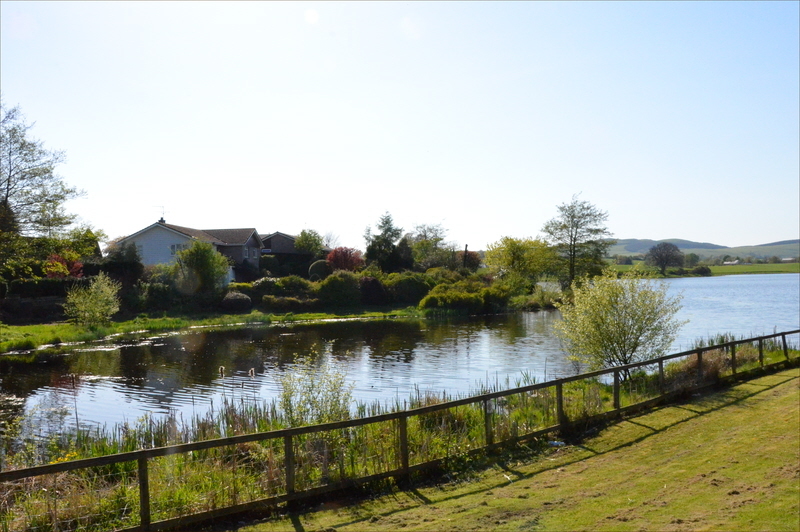 I finished the ride by stopping as we came back into Lochmaben to take this picture of Mill Loch, one of the Lochs that give the town its name. In the evening, I went up to the Archive Centre to copy 50 Heritage DVDs. The original 200 we made have gone and there is still a keen demand for them. That is very satisfying for the people who helped make them but it does mean a fair amount of production work. I have got another 150 still to do. 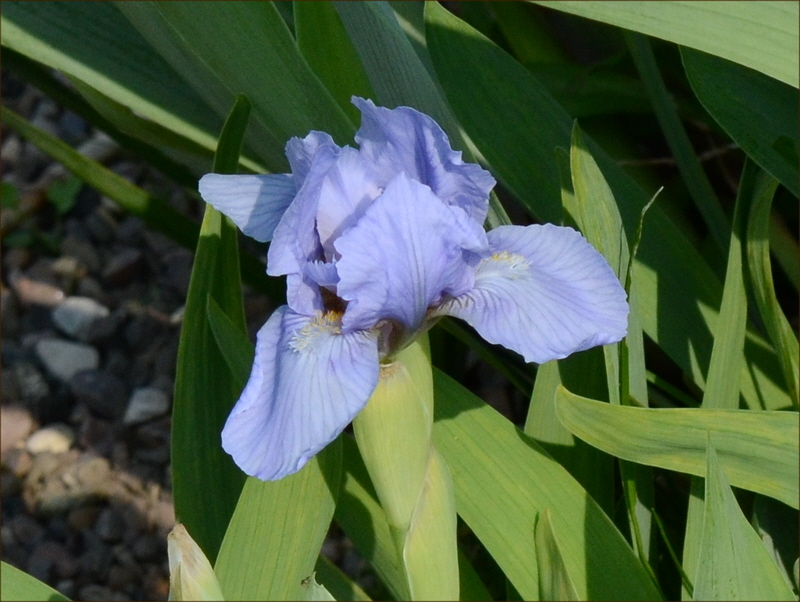 Today’s picture is one that I took yesterday on my walk and forgot to put in. 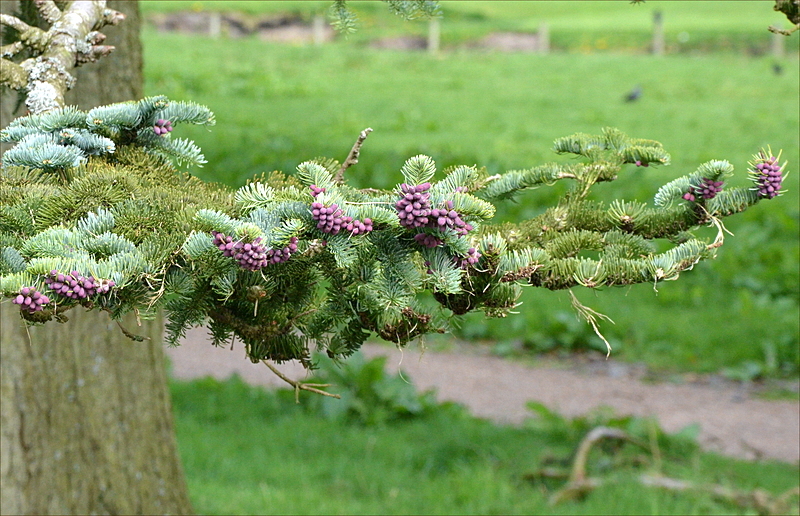 It is of the tips of a conifer of some sort on the Castleholm. Our usual run is 20.6 miles and this was 29.5. Our usual run has two little hills, this one had four big ones. Apart from that they were identical. Even Dropscone had to admit as we were grinding up the long, steady climb to Penton, that he must have been younger when he did it before and found it quite flat. The vigorous breeze into our face didn’t help either. In spite of all this, the ride was good fun and it was enjoyable to vary our usual routine. The only downside was hitting a very bumpy piece of road as we were going down one of the steep hills. I was hanging on for dear life because when we get up a bit of speed, I can’t see well enough to spot the potholes before I hit them. We found that section a bit too exciting. His bike turned out to have no more hidden injuries so that was good to know. The scones and coffee went down very well afterwards. 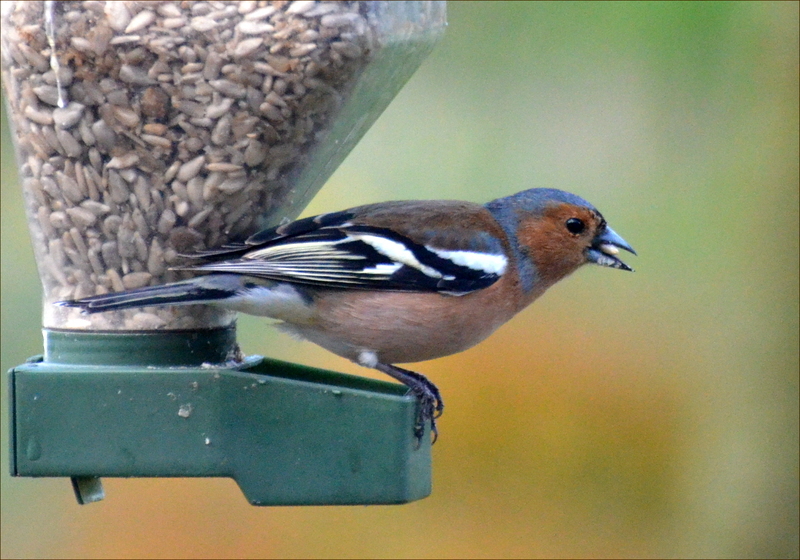 I have been neglecting the chaffinches in the garden lately so here is one from lunchtime today. 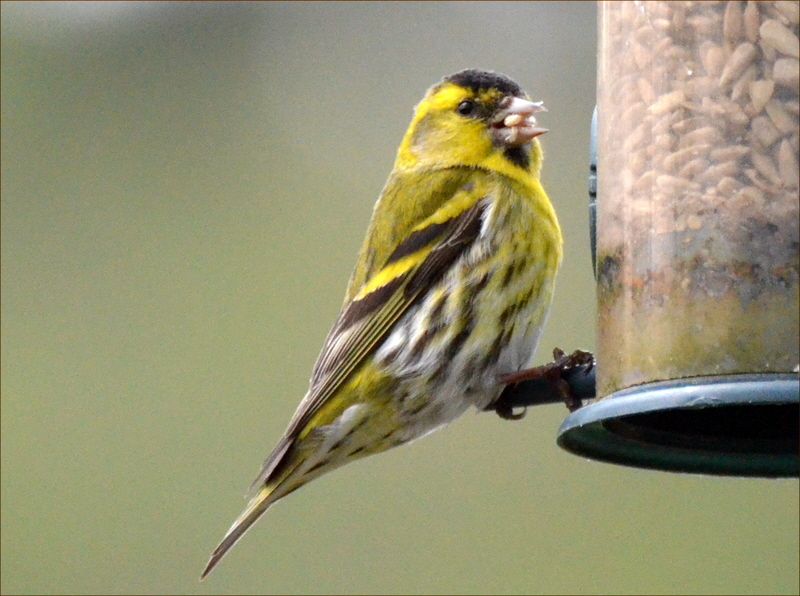 As well as the chaffinches, we still have occasional goldfinches and siskins at the feeders along with the sparrows. 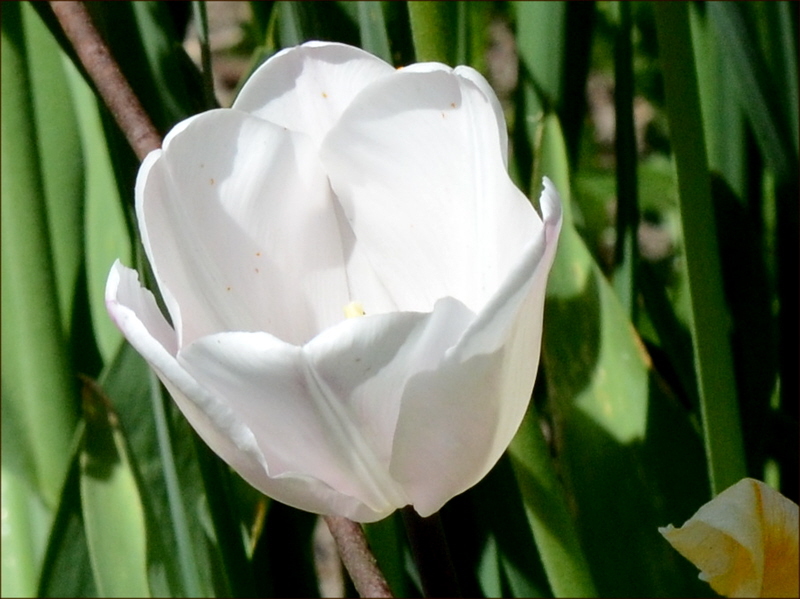 The daffodils are almost all gone now and the tulips are feeling their age a bit as well. They are still making a good show, even though some are past their best and new ones keep on appearing. 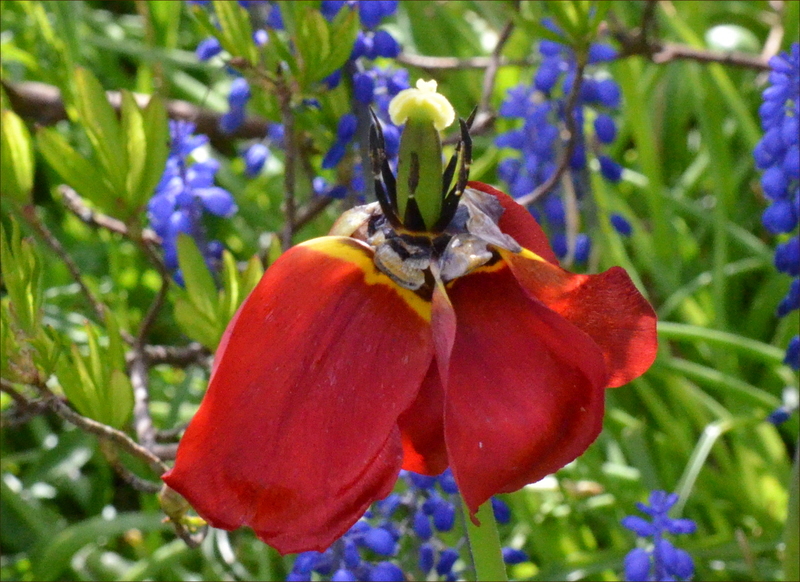 I like these ones that look a bit like a jester’s hat. The more normal ones arrive in slightly different colours all the time. 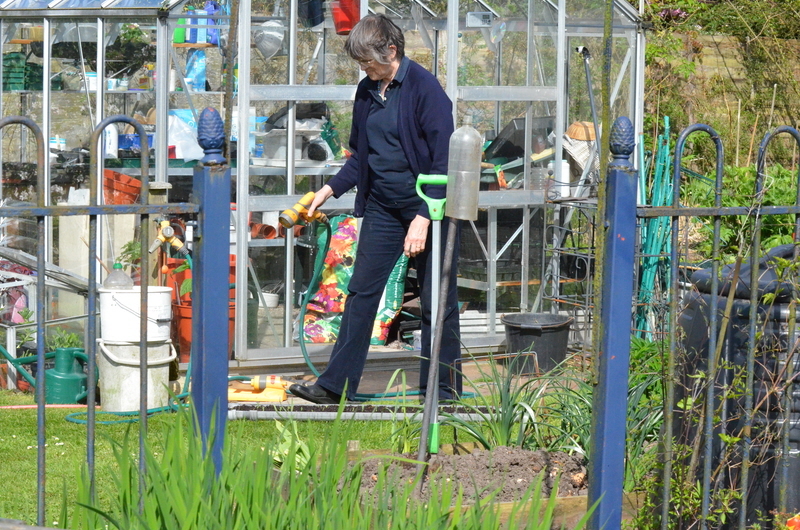 Mrs Tootlepedal was out and about in the garden as normal and here we see her watering some young peas which she is bringing on in a gutter. This makes it easy for her to move them in and out of the greenhouse as required and she can just push them off the end of the gutter all at once when she needs to plant them out. We had a trip to a local garden centre to top up her supply of garden seeds and I took the opportunity to drop the speedy bike off at the bike shop on the way to see if I could get the annoying noises that it is making sorted out. The garden centre is one of these modern places and Mrs Tootlepedal was able to add a pair of sandals to her seed purchases while I bought some cheese and two lamb’s kidneys for my tea. We did buy a tomato and a sweet pepper plant as well. 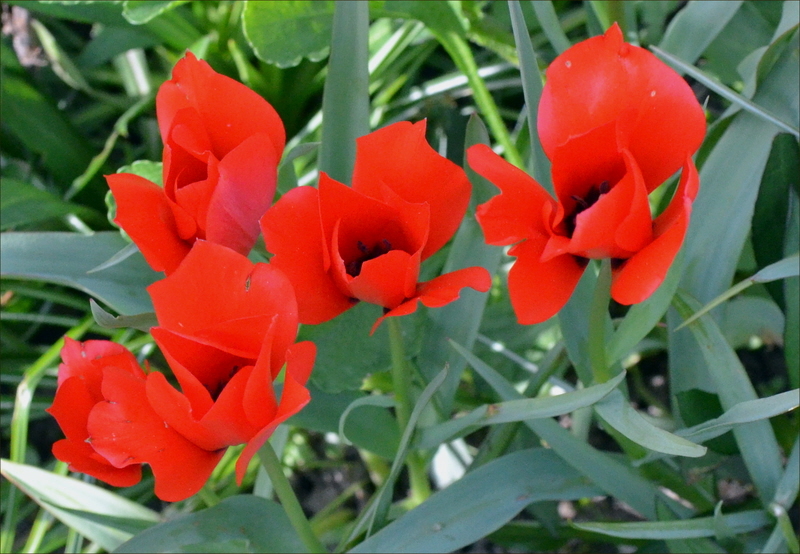 I hope they survive the forecast cold nights that we are about to have. 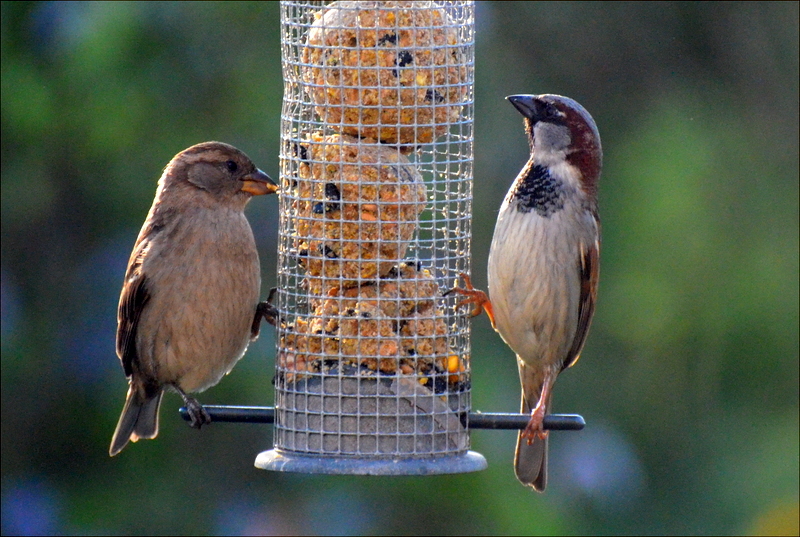 I noticed these two sparrows doing a his and hers act on the feeder in the evening. 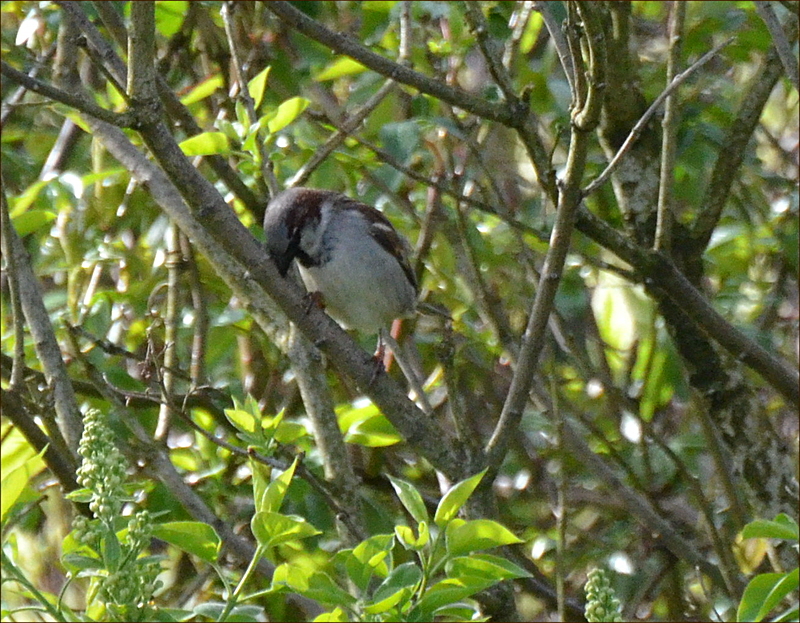 It was interesting to note yet another sparrow putting the wire in his beak as he nibbled on the lard ball. Maybe there is only one sparrow that does this and I just happen always to notice him. 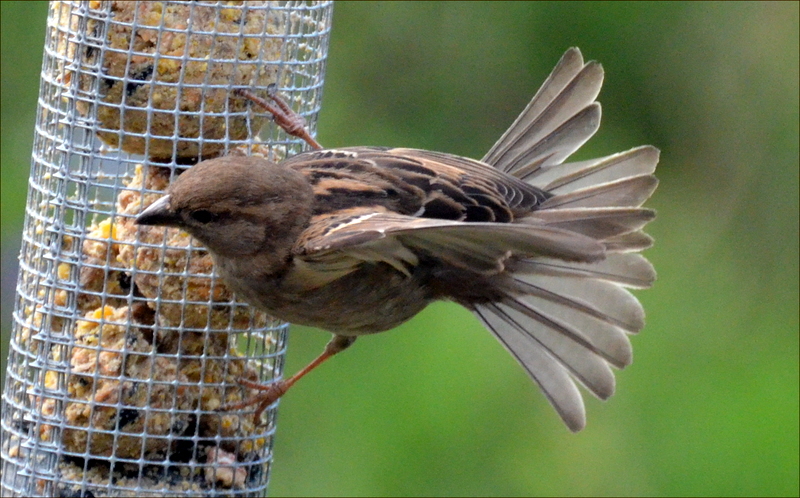 I must say that all sparrows look rather alike to me. 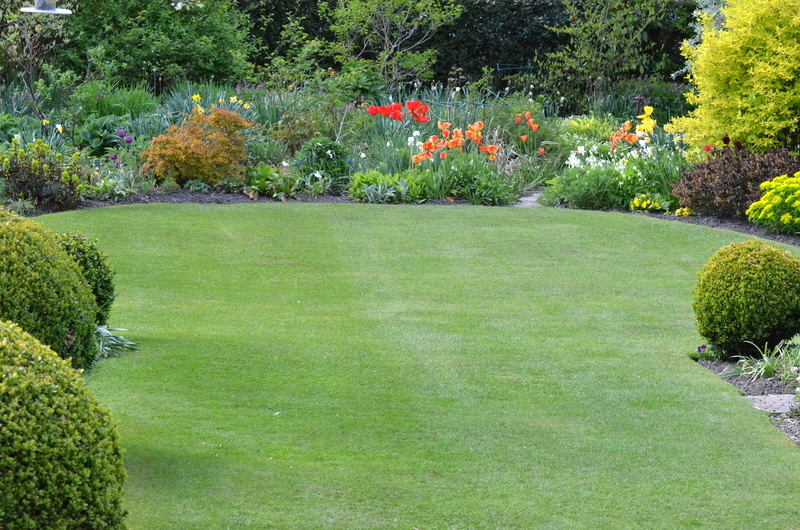 In the low evening sunlight, I couldn’t resist this shot of the lawn. It always makes it look better than it really is. Because our customary recorder group host was on holiday, the group met at our house tonight. This suits Susan and me because it means we don’t have to spend time travelling to Carlisle and it made the evening of playing even more enjoyable than it usually is. Unfortunately, I had forgotten to provide any biscuits to go with the post playing cup of tea. Nobody’s perfect. 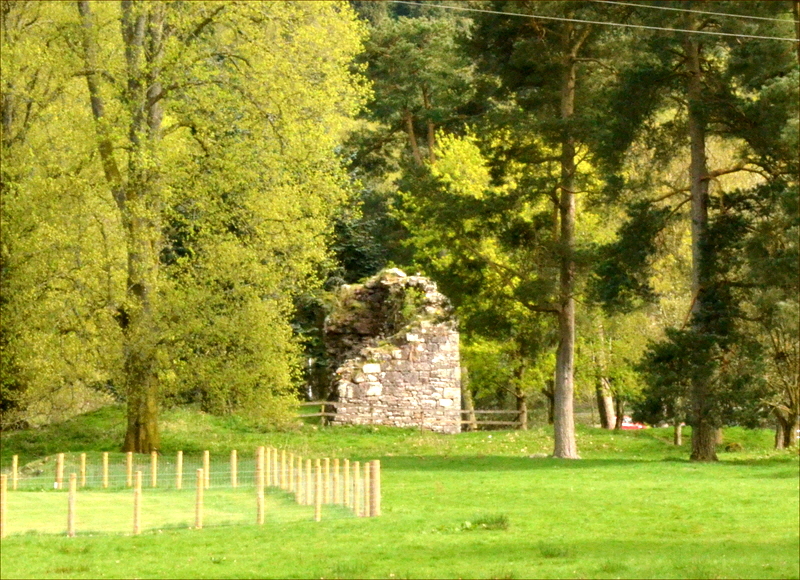 Today’s picture is from Dropscone. This is his cherry tree. Dropscone has not been discouraged by the savage attack on his bicycle and he presented himself punctually for the morning cycle ride. Because of the rather expensive sounding noises coming from my speedy bike, I got out the slow bike in the vain hope of a really gentle pedal. This hope was dashed by the strong wind that blew into our faces on the second half of the route. My asthma was also not at its best for some reason and even Dropscone’s excellent girdle scones and a cup or two of coffee couldn’t cheer me up a lot which is most unusual. 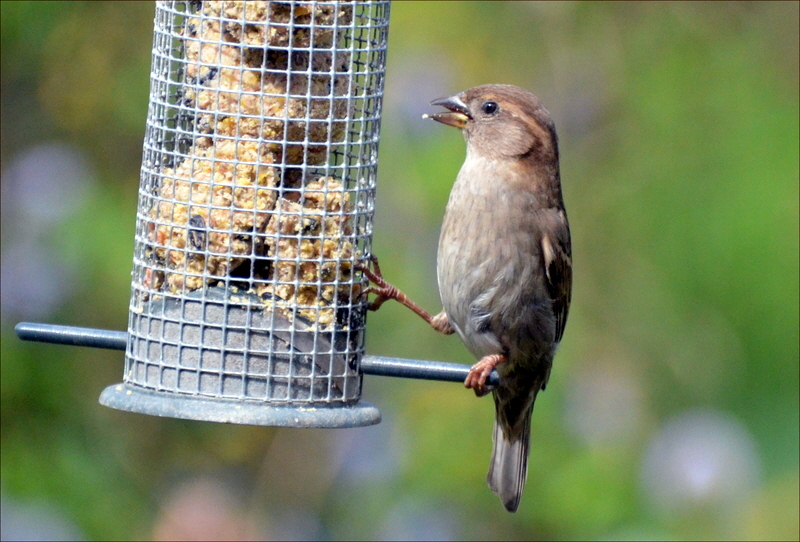 The sparrows were out in force again. 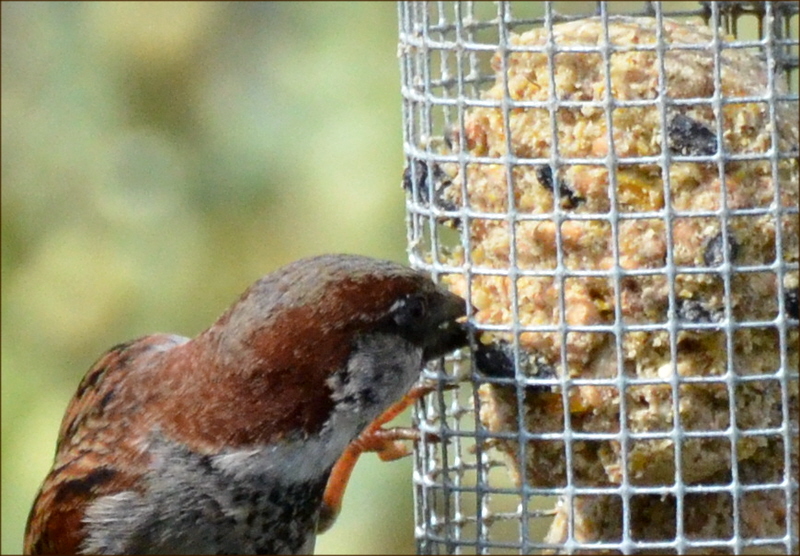 I was interested to see when I looked at the pictures on my computer, that here was another sparrow pecking at the lard balls with the wire inside its beak. It seems very odd to me. 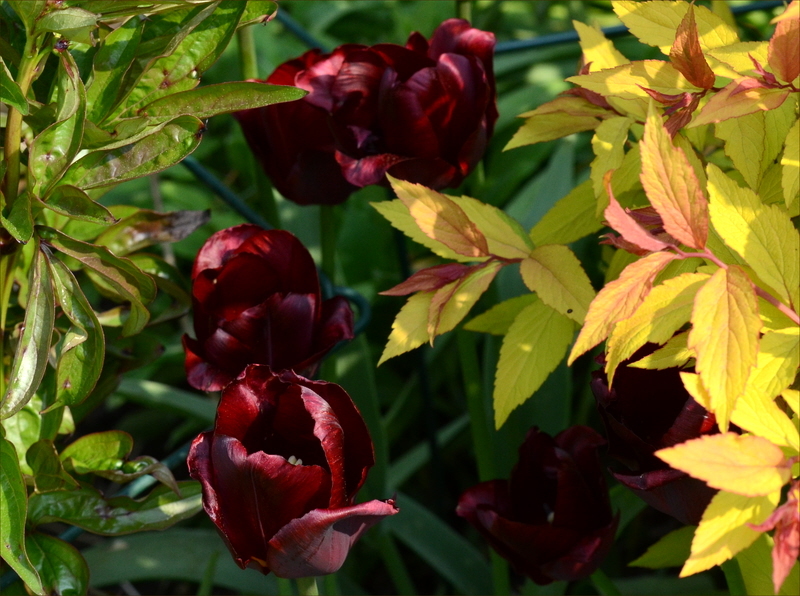 Mrs Tootlepedal drew my attention to these tulips.. 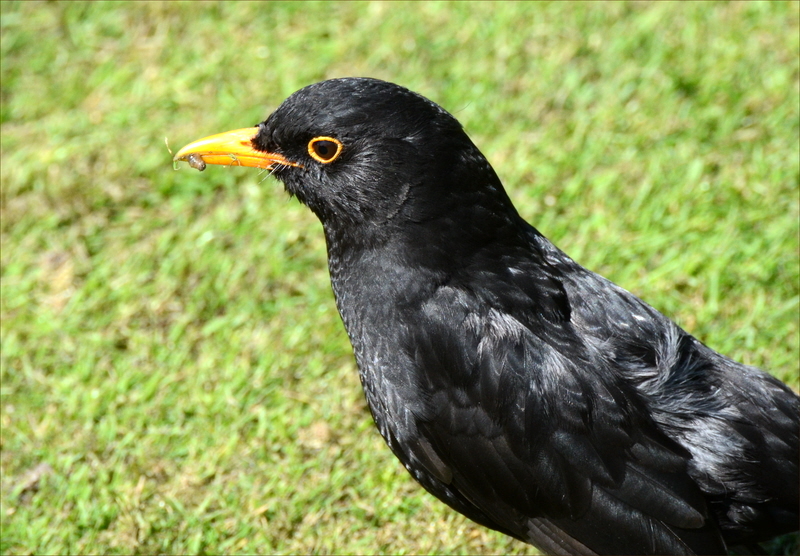 The blackbirds in the garden were fighting running, or rather flying, battles all over the place. 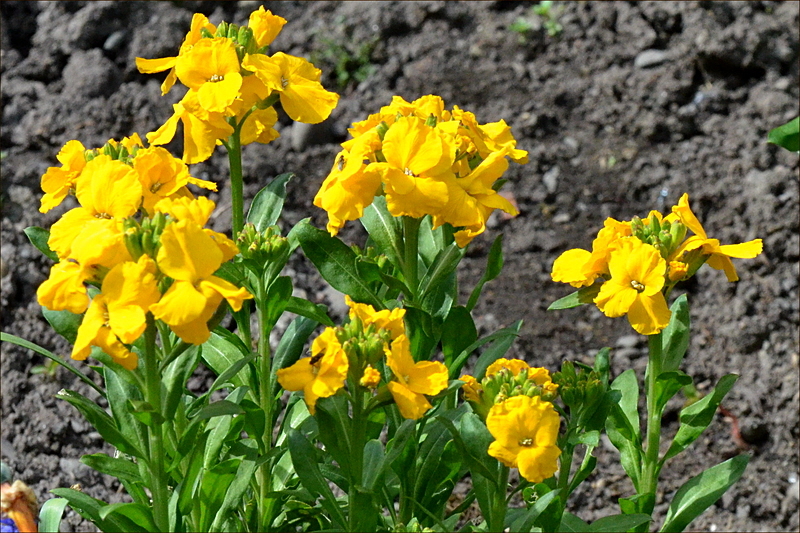 I finally managed to get the camera settings nearly right to take a picture of these vivid yellow wallflowers. The breathing didn’t get any better during the day so I spent it quietly doing little tasks here and there and then sitting down. In between rests I managed to sieve a bit of last year’s compost and it looks very good when it is added to the vegetable beds. Then I puffed up and down with the mower on the lawn that I had put the moss killer on and things look quite promising there. I won’t know whether the moss killing has been thoroughly successful until I have scarified it in about a fortnight. 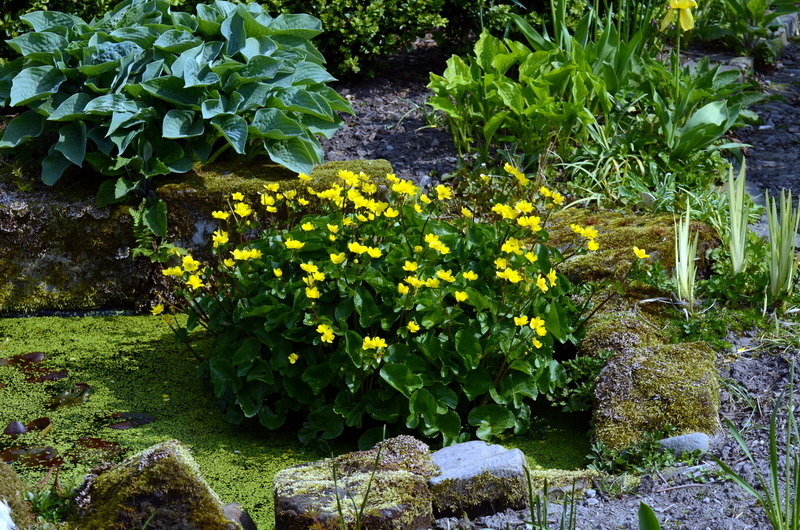 The other lawn, which gets very little sunlight in the winter (I have asked our neighbour Liz to move her house but she won’t), has got too much moss to risk killing it until the grass is stronger so I gave it a weed and feed pro tem. 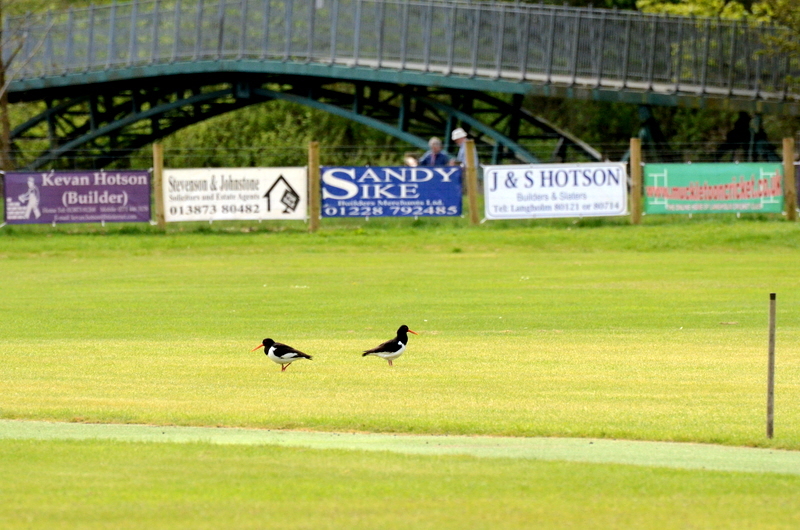 I caught a glimpse of a bird swooping across the cricket pitch. 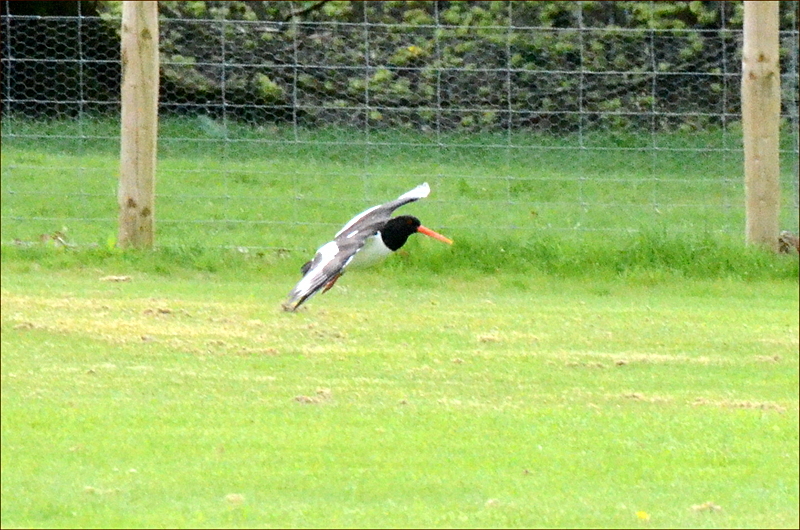 It was an oyster catcher coming to inspect the wicket with its friend. There are no prizes for asking which one is the Dickie Bird. 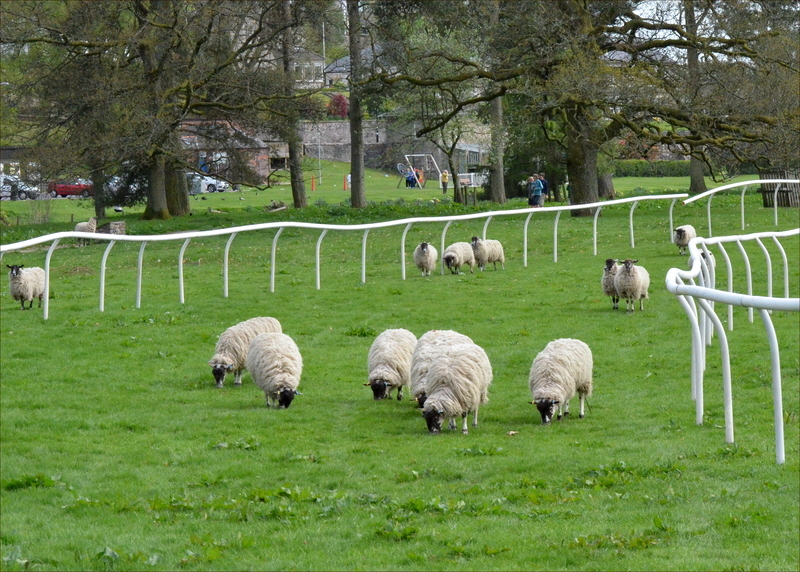 There was an exciting moment when I witnessed the final moments of the great sheep race. 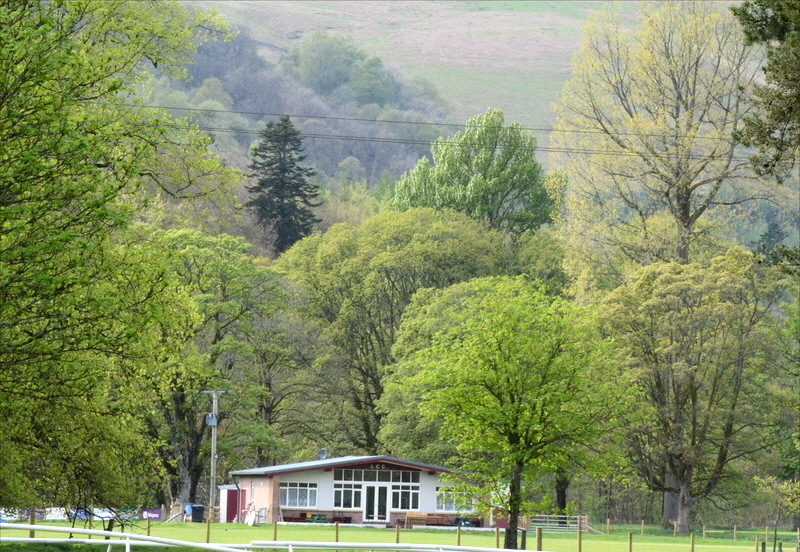 This is a view over the cricket pitch with Meikleholm Hill in the background. 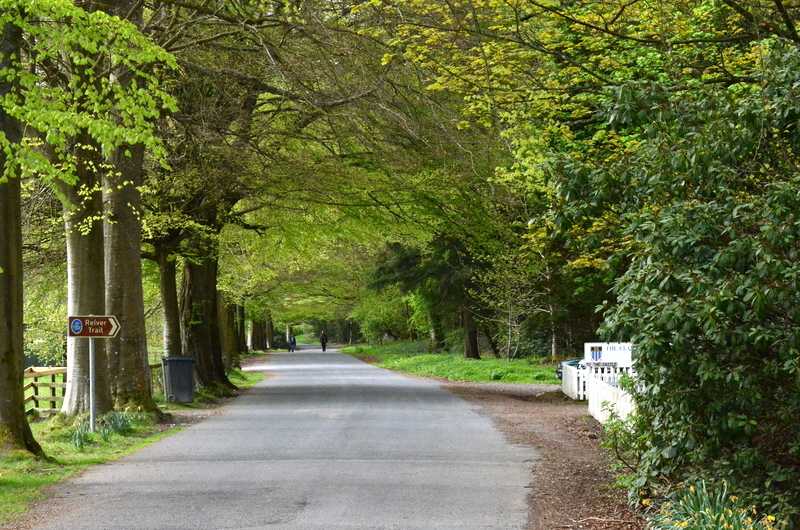 The lodge walks were looking very green too. 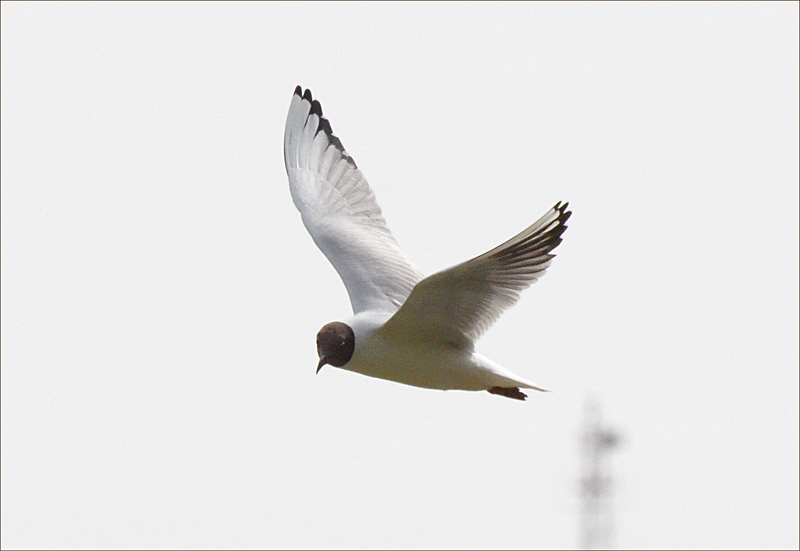 When I got to the Kilngreen, I had to have a little sit down and while I was resting, I couldn’t resist having one seagull shot. 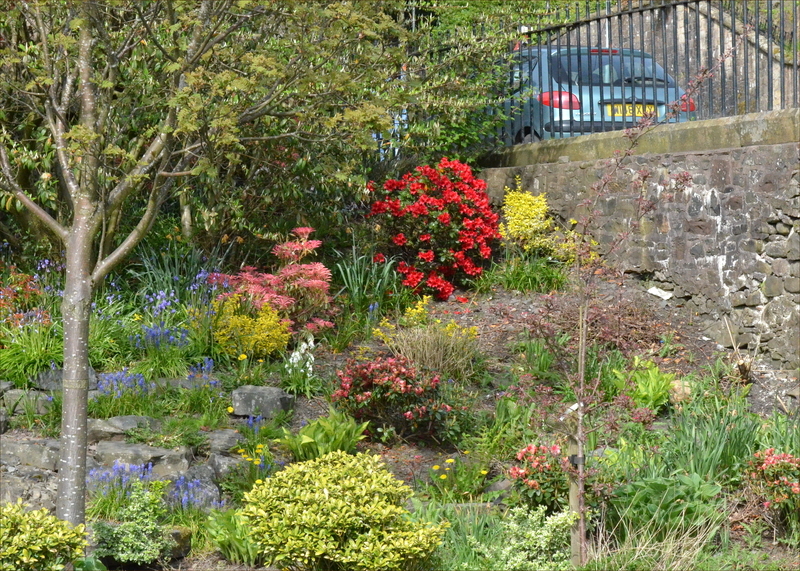 On my way home, I was struck by a burst of colour in the Clinthead Gardens which are looked after by the scout group. ..and another when I crossed the Langholm bridge..
We were very pleased to get a gift of some cycling leaflets which Ruth McKimmie had thoughtfully picked up on her travels and delivered to our door. 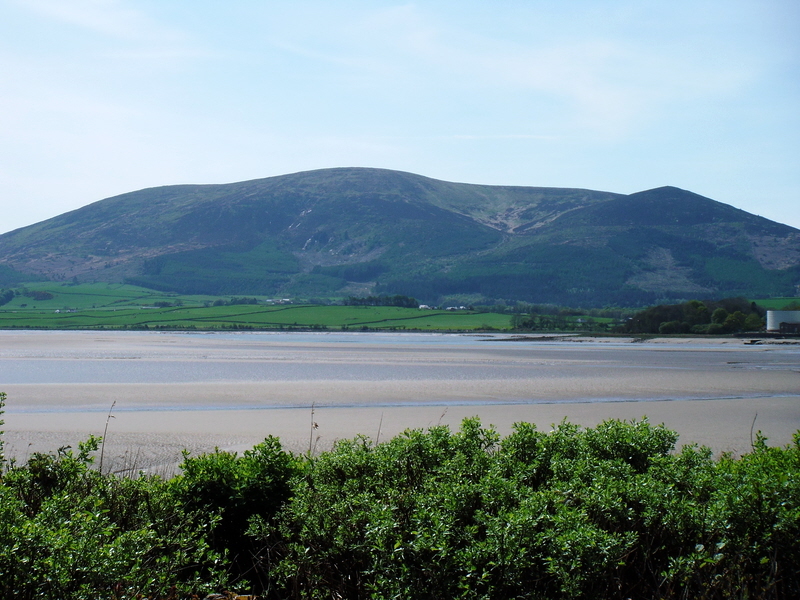 We have unknowingly already done two of the suggested Solway Coast routes but we will certainly do three of the others so that was a very useful gift. We were so excited by looking at the leaflet for the Yorkshire Dales Cycleway, a 130 mile tour of some very scenic countryside, that Mrs Tootlepedal asked me to send off for the map of. I have done so. I hope that the weather and events mean that we get to actually use the map and not just look at it with envy. In the evening, my flute pupil Luke came and it was very pleasing to find out that he had been doing some good practising which had produced excellent progress. It’s a long business getting to grips with the flute but he has made a good start. 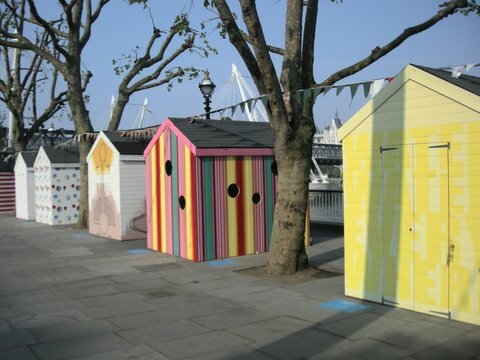 …and added some beach huts too. The day was forecast to be foggy and still and, once again, the forecast was right. It was sunny in our garden but quite foggy by the time I got to Skipper’s Bridge. I was on the speedy bike to take advantage of the continuing high pressure by going a decent distance. 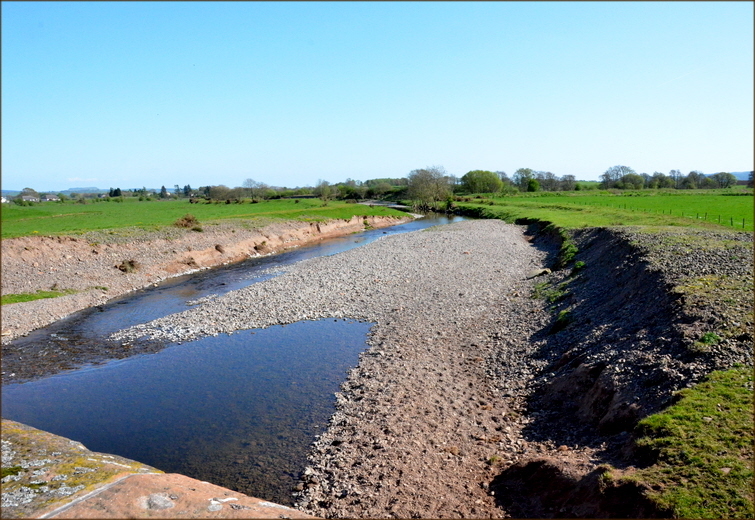 I hadn’t entirely chosen my route until I got to Longtown when I finally definitely decided to go to Dumfries by way of Caerlaverock. This is a largely flat route with some very nice views across the Solway and the Nith estuary. I went through Gretna and Annan before turning off on the coastal route to Cummertrees and Bankend. It had been quite cold when I started and I had a light waterproof on. By the time I got to Gretna, the mist had cleared and the sun was out and this is how it stayed for the rest of the day. I just had a couple of bananas with me so I needed to stop for food. I chose the WWT cafe at Caerlaverock at 37 miles for an early lunch of a cheese and tomato toastie and a bowl of soup. I was able to watch osprey cam while I ate because they have a big screen showing live pictures from the nest site. An osprey was sitting on the nest and it continued to do this while I ate my snack. It was interesting but not exciting. The WWT is on a side road, a mile and a half from the main road so after my toastie, I had to go back to the road and turn left for the Nith estuary and the road into Dumfries. 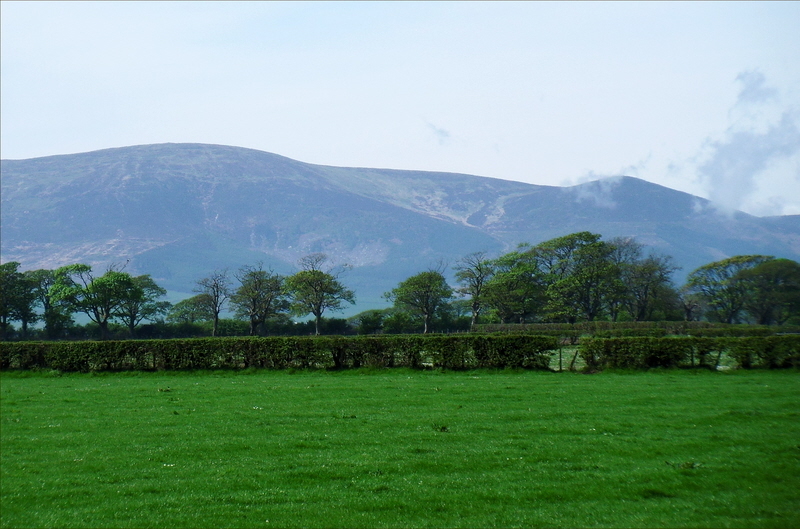 As I left the WWT, I took the picture of Criffel which dominates the view on this part of the ride. You can see the last remnant of the morning mist drifting upwards from the hill side. I whistled up the estuary into Dumfries, passing through Glencaple. When you are a mile or two out of town, there is a very nice bike path into the centre of Dumfries along the river bank but there were so many pedestrians out for a sunny walk that it was not very satisfactory. I turned for home to find that the wind had got up quite a bit and it was now straight in my face as I went back down the river side. The road surface was also very poor. This hadn’t bothered me too much when I was cycling up it with the wind behind but it was very uncomfortable battling back down it into the wind. The murk of the last few days had cleared off to a large extent and so I stopped to get a rest from the wind and the bumps to take another picture of Criffel across the river. At the bottom of the estuary, the road turned to the east and the wind was now behind me. I stopped for another quick meal at the 57 mile mark. 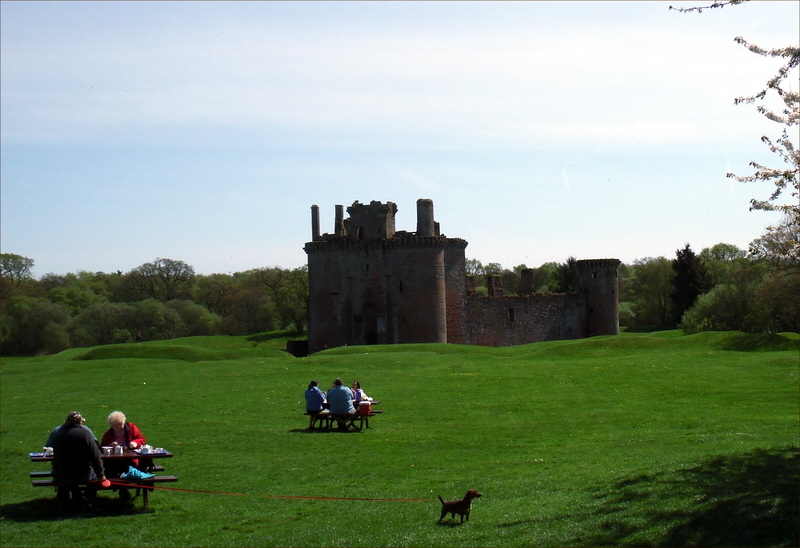 This time I tried the cafe at Caerlaverock Castle. It too offered soup and a toastie, which I took. The only difference was the price which was a good deal higher than the decent environmentalists of the WWT. The next 40 miles were made very pleasant for me by the stiff wind mostly at my back. Even when it was from the side, it was still no problem. It is not often that the wind behaves exactly as it should and today was a day when it did. It is all the sweeter for its infrequency. The traffic was very light, the surface from Caerlaverock to Langholm was fine, I didn’t get a puncture, I couldn’t have asked for more. The only slight fly in the ointment was discovering that I was 3 miles short of the hundred when I got back to Langholm and this necessitated a short excursion up the Wauchope road to fill in the missing miles. The flat route and the helpful wind conditions, combined with a temperature that never got too hot, meant that this was probably the easiest 100 miles I have ever pedalled. I didn’t go very fast, the outward journey being at 15.2 mph and the whole thing ending up at 15.6 mph. When I got home I had a nice cup of tea and then met our B & B guests for the night. They were on a walk from Durham to Oban which is a pretty good hike. The man had done the London-Edinburgh-London bike event last time it was held. This entails doing 800 miles without stopping. He had taken four days. That put my little 100 into a proper perspective. I bow down to him. 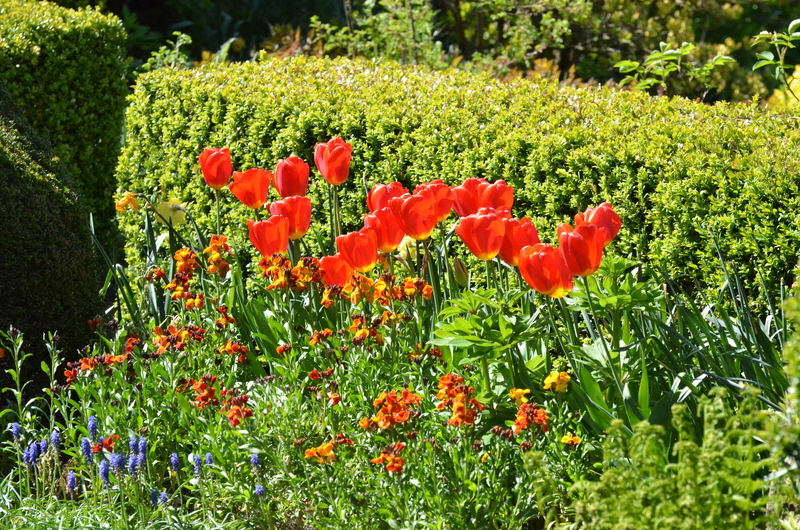 The garden was looking lovely in the early evening sunshine. The march of time. 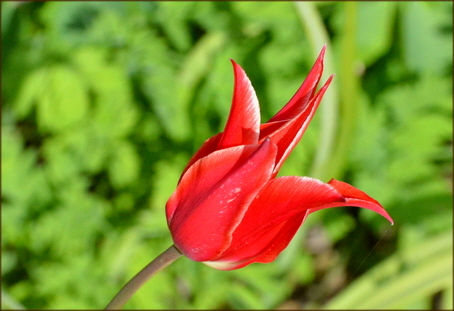 A tulip lets it all hang out. 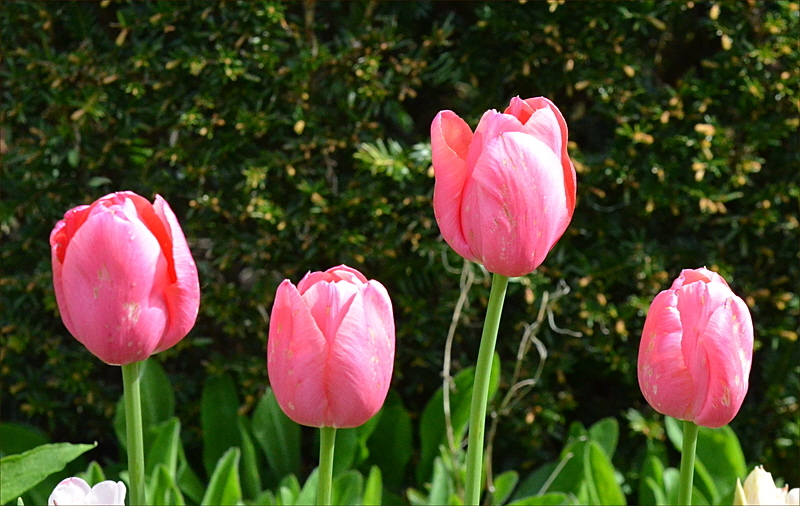 Mrs Tootlepedal can't remember planting these tulips. A pleasant surprise. 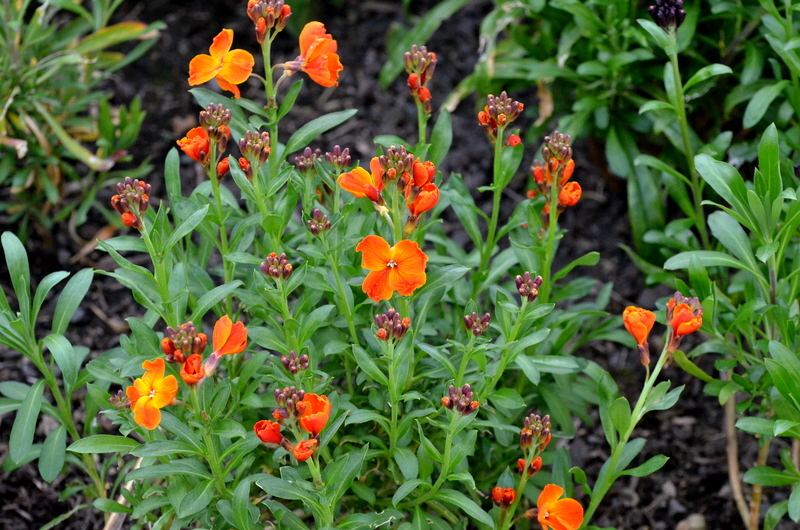 The next big thing is the arrival of the wall flowers. We are at the fist stage of this process. 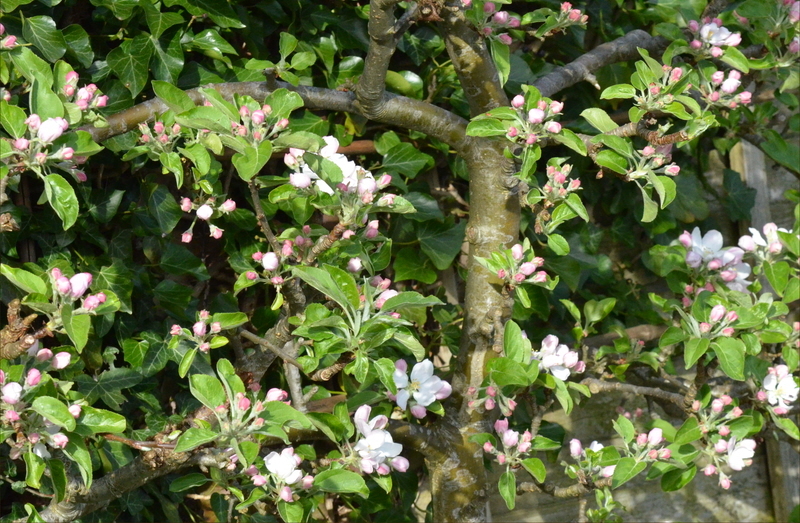 I showed selected apple and cherry blossom yesterday and by today the apple espaliers were nearly fully in flower. 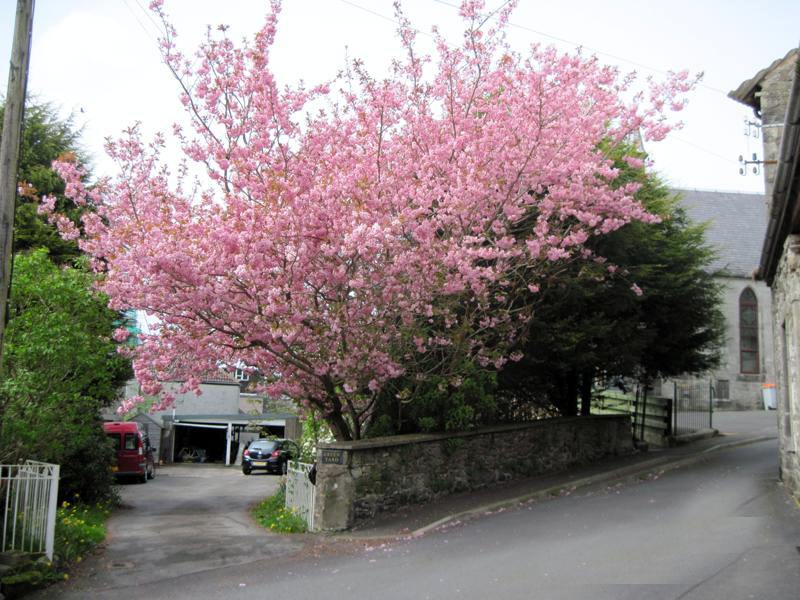 ..and here is a fuller picture of our neighbours cherry. Amongst all this brilliant colour, the blackbirds continue their work of denuding the soil of worms. 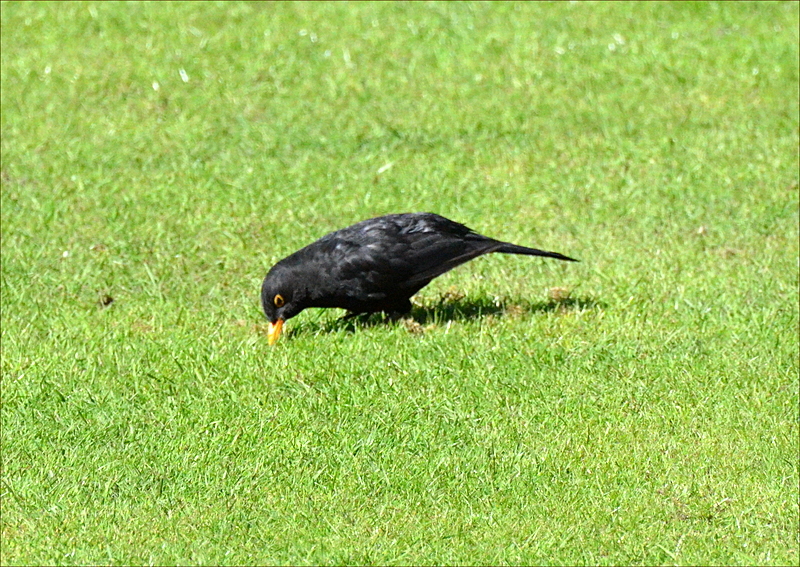 Here is one of them sprinting across the lawn, a valuable soil conditioning expert in its beak. 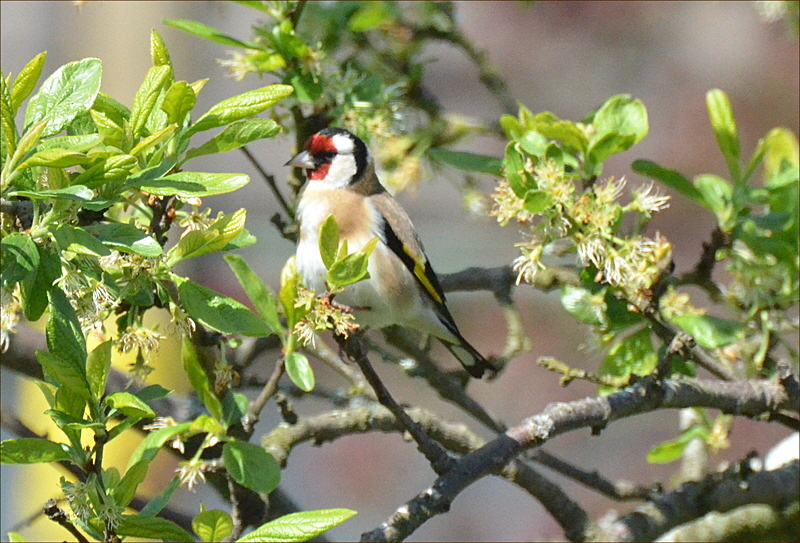 Still, they fill the garden with song so perhaps I shouldn’t grudge them a worm or two. We shall see how the legs feel when I wake up tomorrow morning ready for the usual excursion with Dropscone.